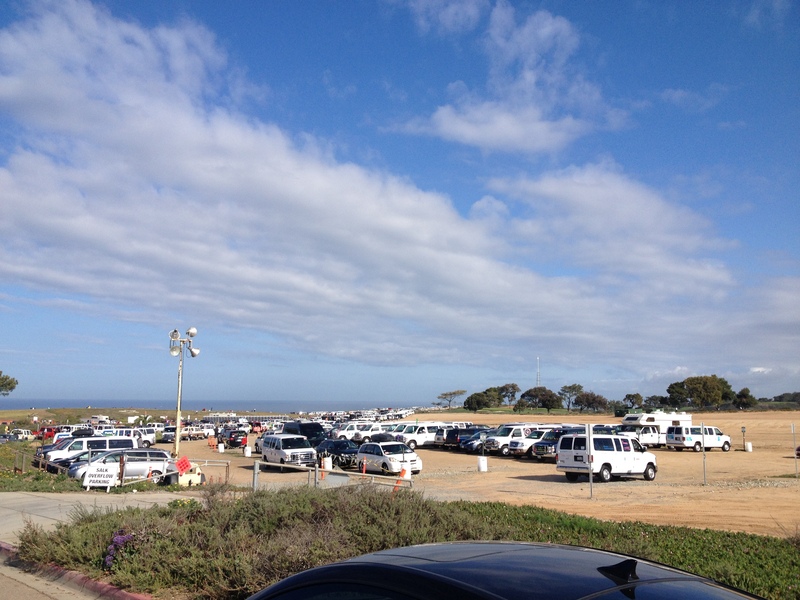 When we arrived at the Glider port at the top of Torrey Pines we were met with once again a crazy amount of vans. It was chaos driving in. Finally we found a place to park and settled in for a little while. I knew I needed to sleep a little so I stretched out in the front seat and closed my eyes. I was finally able to sleep about an hour off and on. After I got up I realized that I might be sick because of dehydration and started drinking a lot of water and Nuun. After a few bottles I was starting to feel a little better. We walked around the glider port and waited for our other van. Finally they said they were on our way. We were so excited for our final legs. 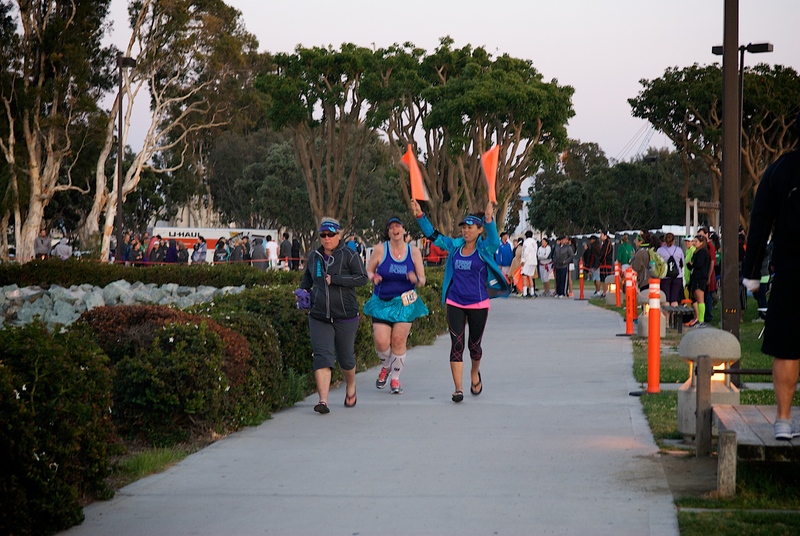 We were also pretty jealous of all the people walking around already finished with their final legs. 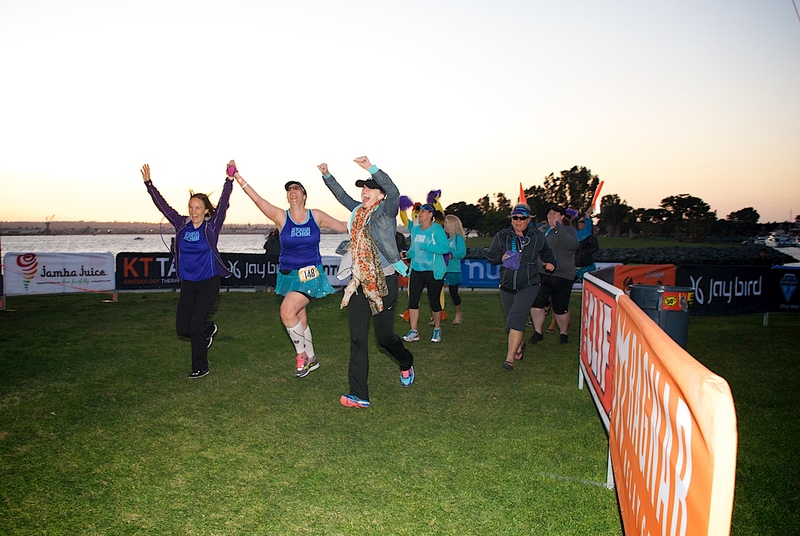 Being van 2 is hard because van 1 is finished and so excited and we were just starting on a few more hours of running. After a lot of pictures and silliness, Helen was finally running in. There we so many people there and we all cheered her in and cheered Amy off on her final leg. Once Amy was running we got in our van and headed for the next exchange. We stopped to get gas along the way. While we were at the gas station, my mom and I ran across the street to a liquor store to pick up some beer for Amy as she finished her leg. She loves beer and kept talking about running for beer so we knew we had to get her some. We stopped at one point in her run to check and see if she needed anything as well. The place we stopped was a blind turn and we directed a lot of people to turn there as the sign was hard to see. We were worried that someone was going to miss the turn. 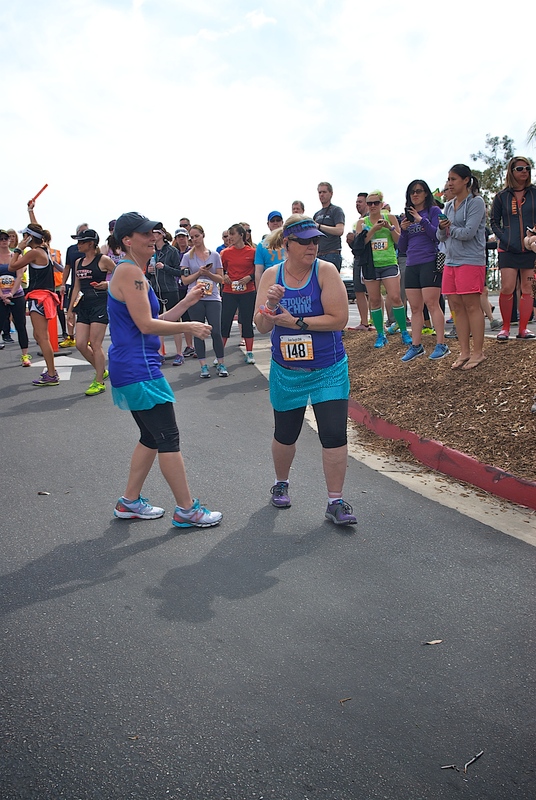 As she finished her leg and handed the bracelet to my mom, she was so excited to be finished with her final leg. We surprised her with her beer and headed to the next exchange. 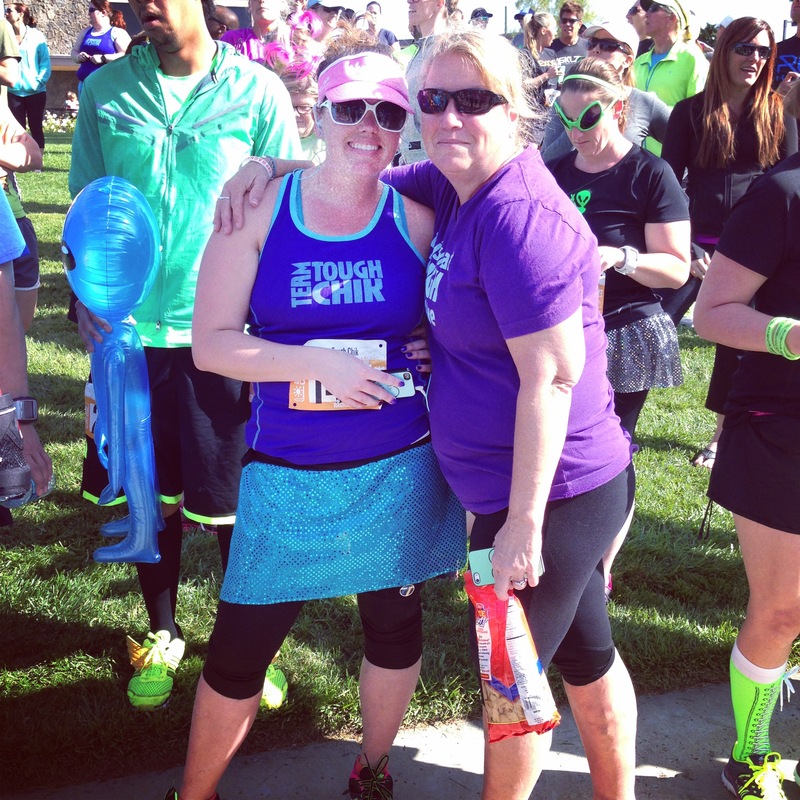 At the next exchange my mom handed off to Kathy and I started to get nervous for my last run. My last run was 7.5 miles. Thankfully I was starting to feel better and was looking forward to getting my run over with. 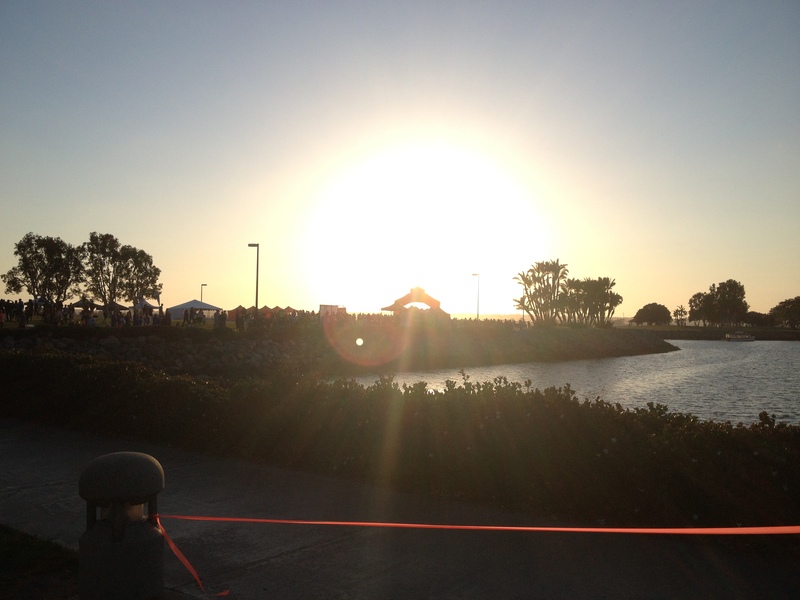 I also knew that my run was supposed to beautiful around Mission Bay. 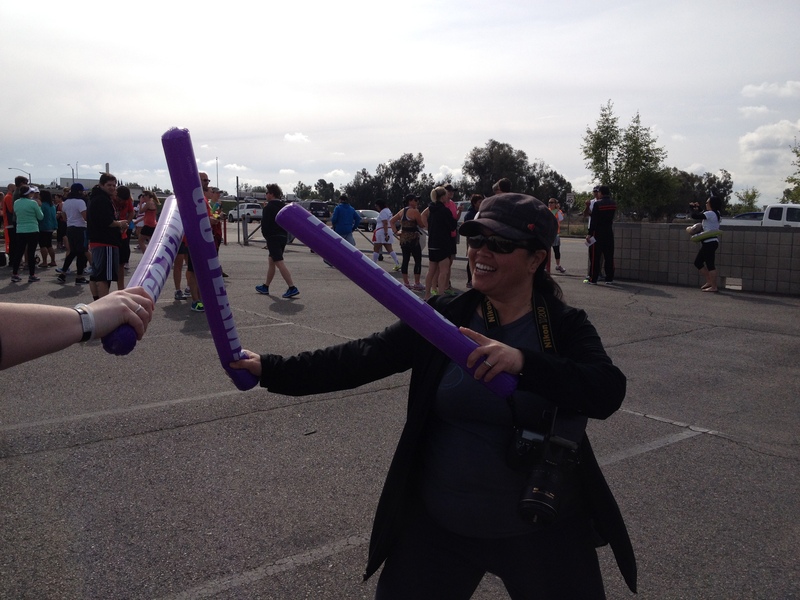 Finally we reached my exchanged at Mission Bay and I prepared to take the slap bracelet from Kathy. When she finally came in I took the bracelet and ran off. I only ran a few feet before I got stopped at a stop light still in the exchange. Finally I was able to run and hit the Mission Bay board walk. It was a beautiful area, even though it was very crowded. I enjoyed watching the people and making myself keep running. Thankfully I wore my garmin this time so I knew my distances. At mile 2 my van met me with water and pictures. 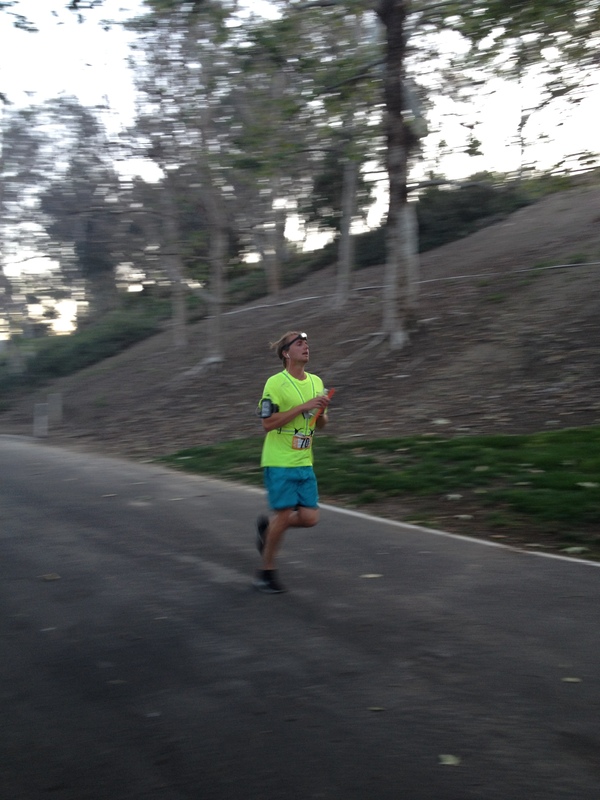 It was nice to finally be cheered on during a run. At mile 3 I turned a corner and was met with 31 stairs up. I thought I was going to die as I ran those stairs. I kept running and running and running. 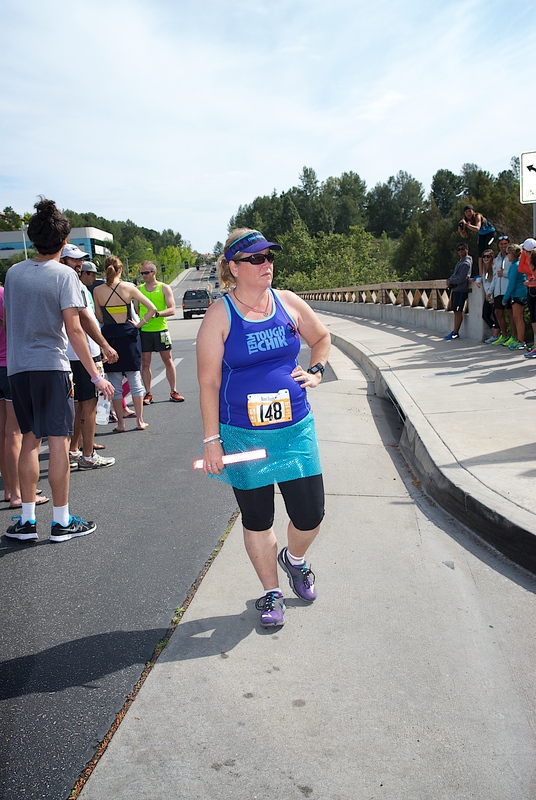 At one point there was a group of people standing on the side of the road cheering for all of the runner and holding beer yelling “this is what you’re running for.” It was a fun run but I was getting really hot and tired. My legs were starting to feel terrible. I knew if I stopped to walk for a little I wouldn’t be able to start running again. Finally after what seemed forever, I saw the one mile to go sign. After that I was hit with a lot of wind and smoke from camp fires. It made for a really long last mile. Finally I saw the exchange and all I could think of was jumping in the water. 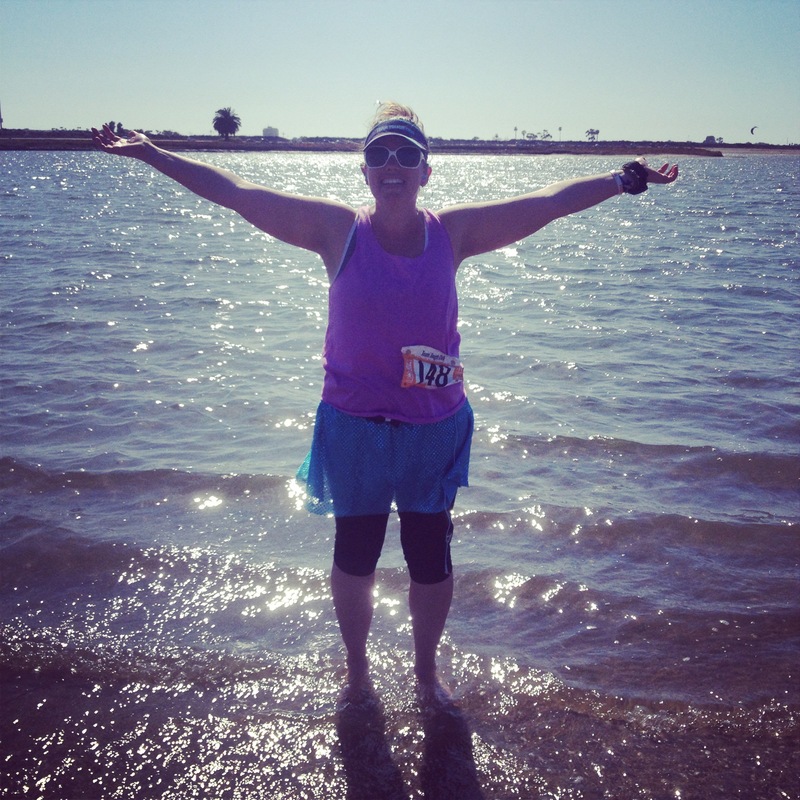 As I handed off the bracelet I took my shoes off and put my feet in the water. Such a good choice! So excited to see this sign! My moment of joy after finishing!! We had planned to meet Casey at about 3 miles and Tina would take over for her there. Casey’s feet were really blistered and she was hurting. 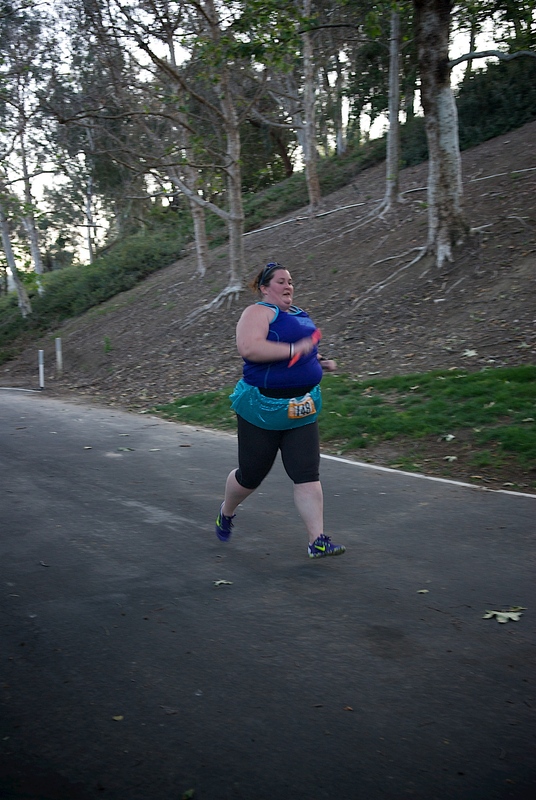 After that 3 mile mark there were some big hills on her leg. As we waited for Casey I changed, foam rolled, and stretched. 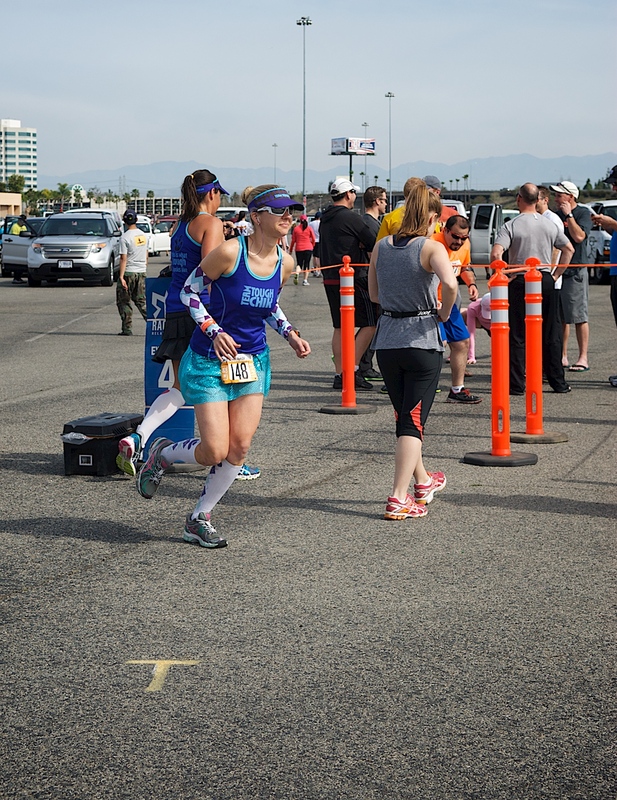 I was feeling really stiff and sore but was so happy to finally be done with my legs. As Tina took over we cheered for her and went to the hills to cheer for her there. She gave us the Finger as we drove by. These hills really were killer. Next we met Tina at the exchange to see how she was doing. Tina is so funny. She came into the exchange yelling, “what do I do, where do I go.” We just looked at her and laughed. She decided she was feeling good and kept running. We then started heading to the finish line. 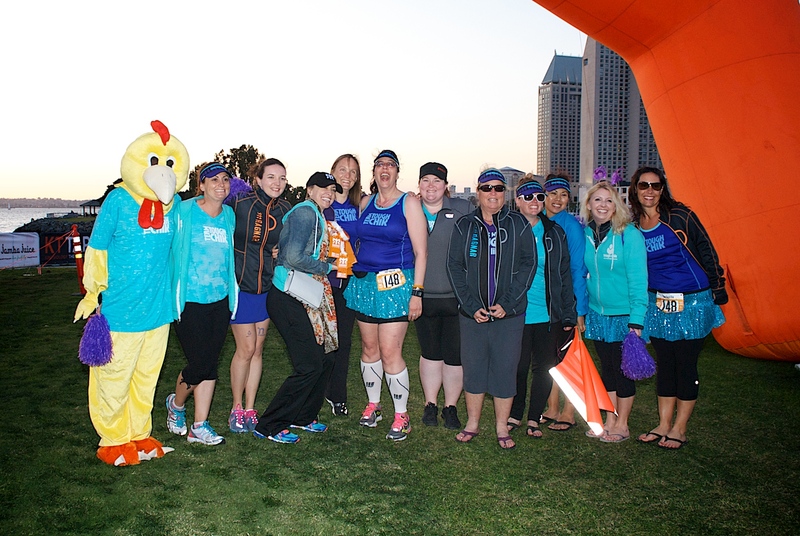 After getting a little bit turned around in downtown San Diego we finally made it to the convention center and the finish line. 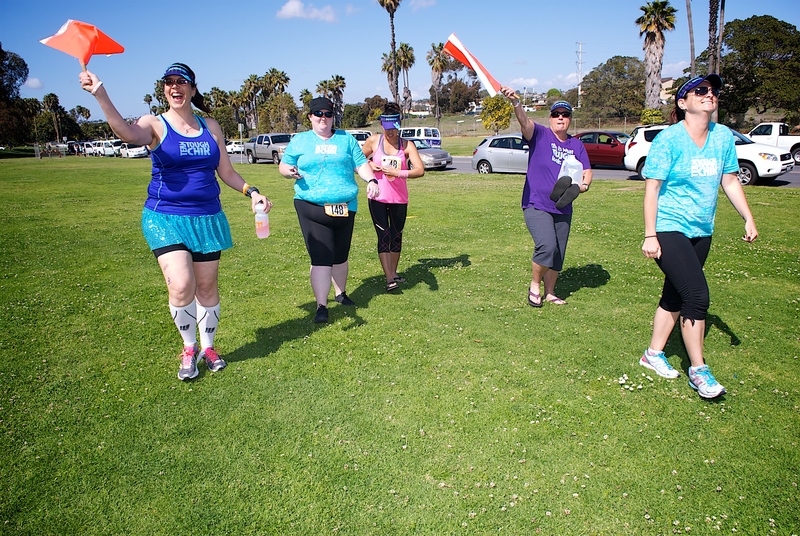 We were so excited to realize we were finally finished with our legs! We waited and waited and waited for Tina to come. It seemed like her leg was taking forever and we were worried that maybe she got lost. Finally we saw her as my mom and Kathy ran in with her. 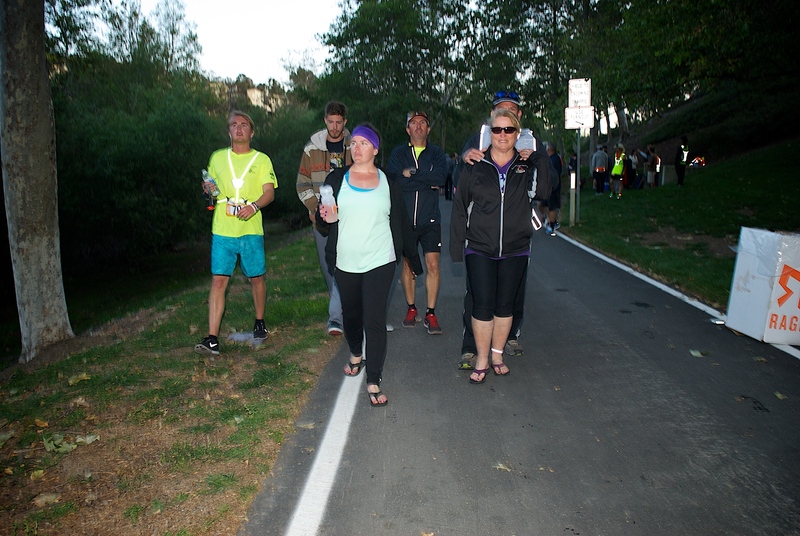 Once she was in the last hundred feet or so the rest of us met up with them and ran over the finish line together! We were all so excited to be finished and receive our medals. 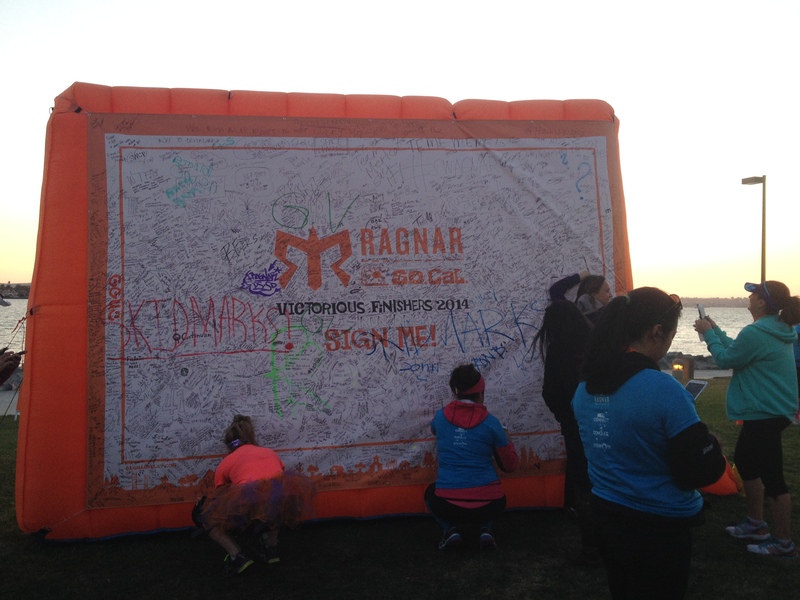 We took pictures and signed the Ragnar wall. 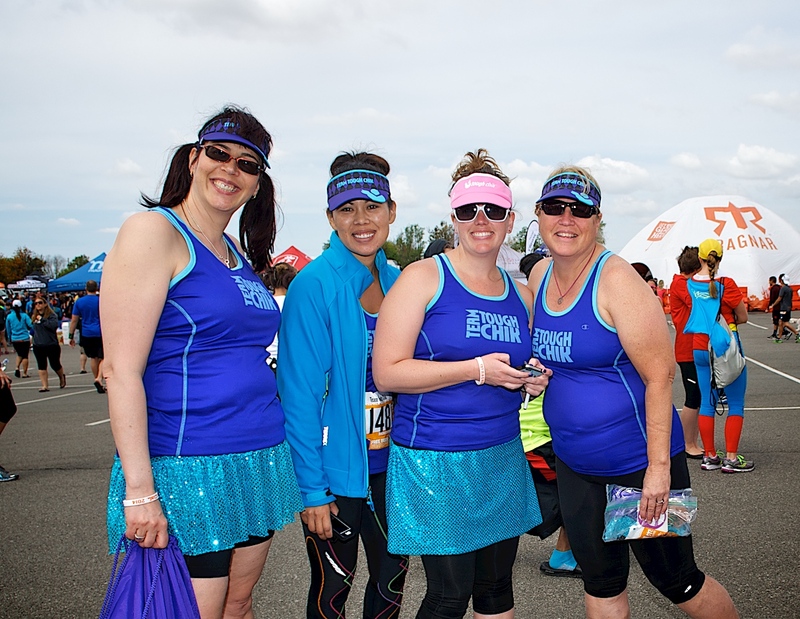 Our team at the finish! 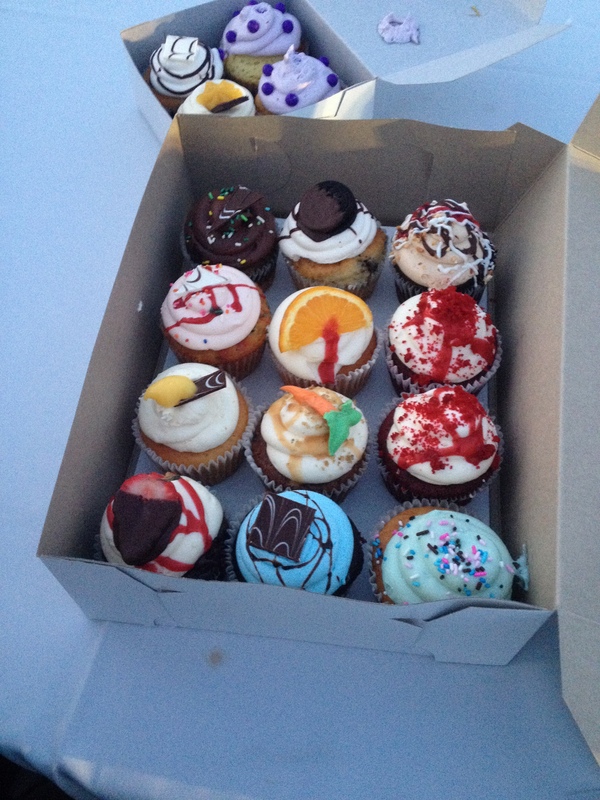 Van 1 had bought us all cupcakes so we celebrated together by eating cupcakes. After our cupcakes we headed back to the van and to find some food. We originally had planned to go to this Pizza place but it was too crowded (it was a Saturday night). Instead we decided to keep driving. I was driving and everyone else was sleeping in the back. I decided we should just stop at Chipotle closer to Shannon’s house. We ate our Chipotle and headed to Shannon’s house to unload and drive home. Finally by time I was home all I wanted was a nice warm shower and to go to bed! 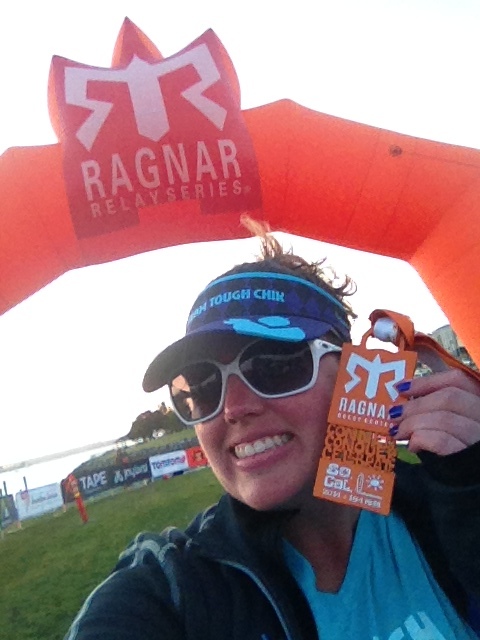 I loved the entire Ragnar experience! 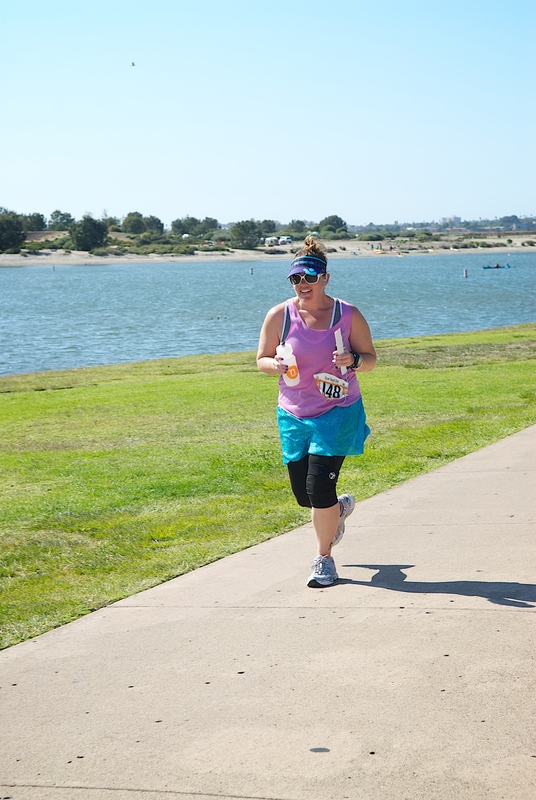 I was really proud of myself for running all of my legs without stopping and felt like I really accomplished something great! 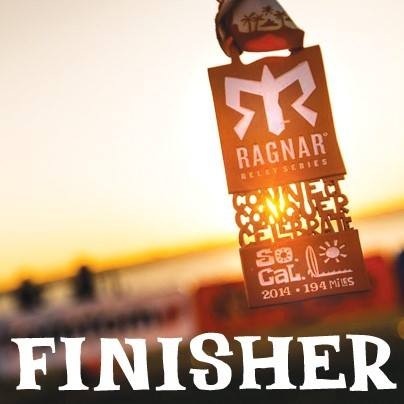 I am definitely look for my next Ragnar and may just be training for a half marathon in the near future. 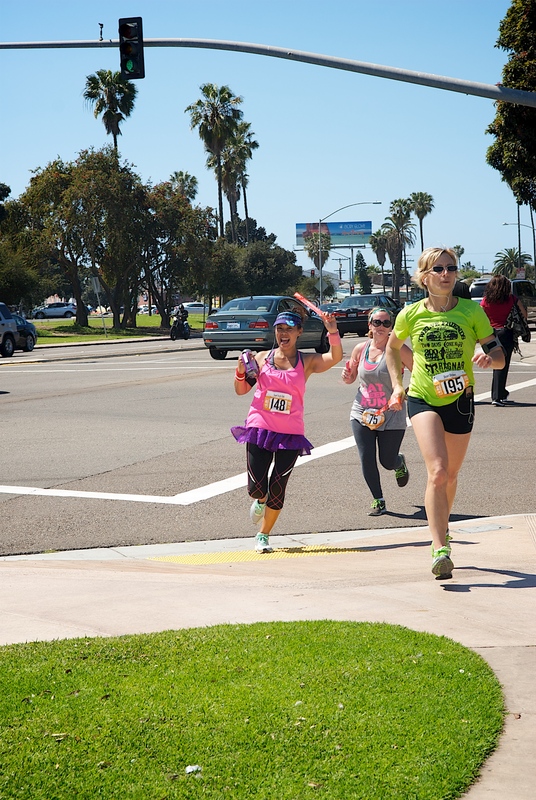 When we left off we had just sent Tina on her First leg and were headed to Doheny State Beach. 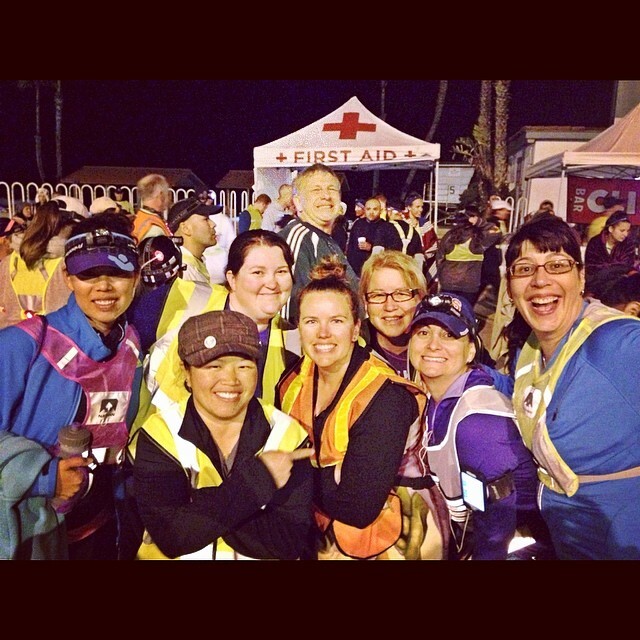 We finally found the mass of people waiting for runners and searched for the rest of our team. We finally found them with someone in a chicken suit. All but my mom quickly realized it was Shannon dressed up as a chicken. Mom took a little convincing before she understood who was in the chicken. As Tina ran in she didn’t even notice Lisa standing there waiting for her and ran right past all of us screaming her name. Finally she stopped and handed off the bracelet. Then we headed to our van in search of some food. 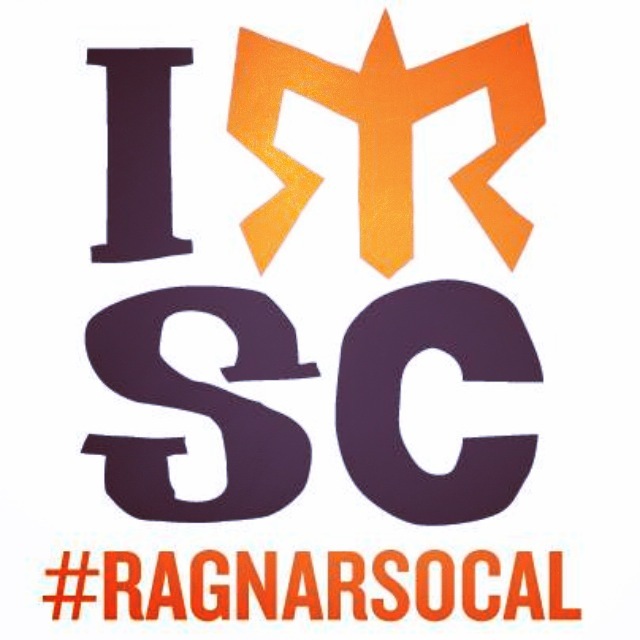 Ragnar gets you on a weird eating schedule. You don’t have time to eat when your van is running so you have to wait until later. We ate breakfast and then ate dinner with little snacks in between. Peanut Butter pretzels saved me! We ended up eating at Wahoos. At that point our main criteria for eating was somewhere we could sit down, inside, with a real bathroom, and that was open. 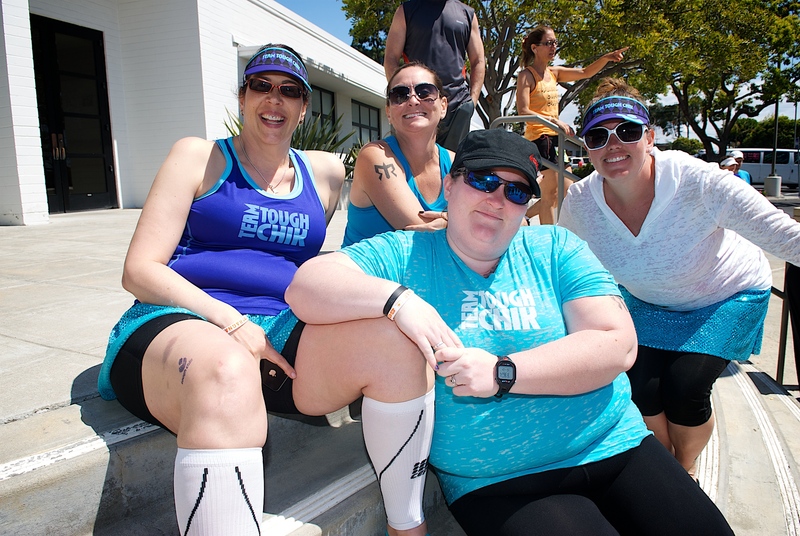 After a quick meal we drove to the next major exchange at the Junior Seau Pier Amphitheater in Oceanside, in hopes of a little sleep before our next set of legs. I had been texting with my dad and uncle Paul, so as soon as we found a parking spot my mom and I grabbed our sleep stuff and walked to the beach. The rest of the group stayed and slept in the van. My mom and I soon found my dad and Uncle Paul sleeping on a big silver tarp on the beach. We layed out our sleeping bags and cuddled in for some sleep. I didn’t sleep at all as I kept checking the time, and updated pace calculator so we would know when they were close. I was so worried we would be asleep when our runner came in. 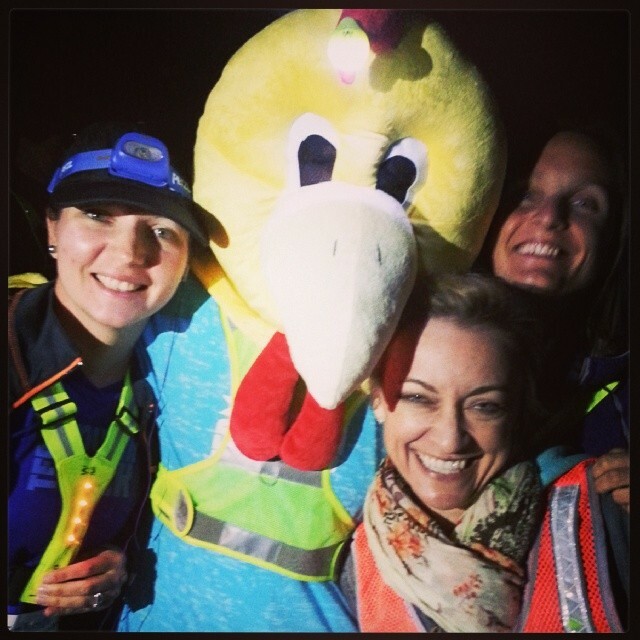 After a few hours we got up and headed to the van to get Amy ready for her first night run. We all walked down to the exchange point and waited for Helen to run in. Her leg was only about 2 miles so we knew she would get there soon. As she came in we cheered and cheered for her to slap the bracelet on Amy and cheered as Amy ran off. Van 1 wasn’t at the exchange yet so we guided Helen up to the top of the pier where we could meet the other van. After some pictures, the other van found us and we were off to the next exchange. On the way to our van it started to rain a little bit. All I could think was, “Amy is going to kill us if it rains.” Thankfully the rain was short-lived. The night exchanges were weird and went by in a blur. 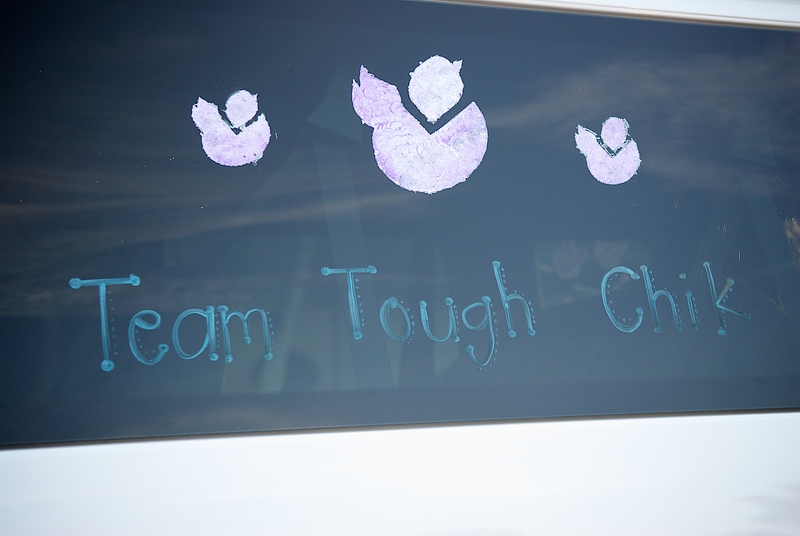 Most of the team stayed in the van while one person and the next runner went to the exchange point. 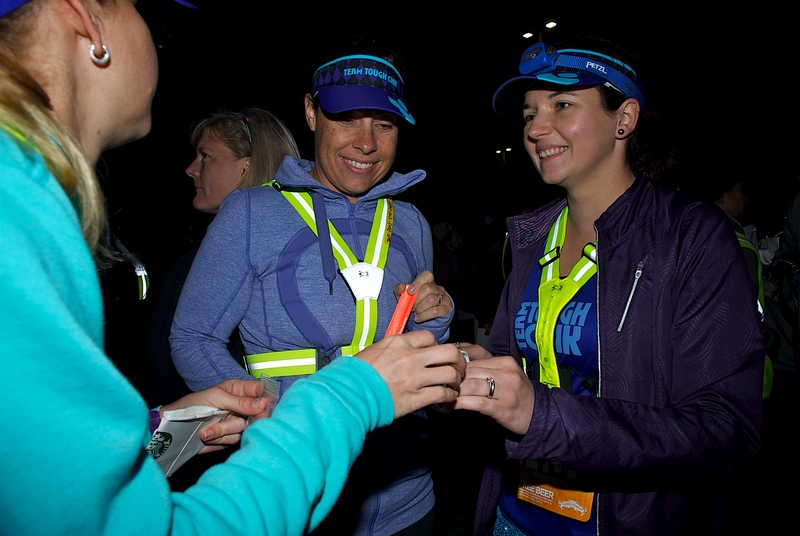 The previous runner slapped the bracelet on the next one and the guide and runner went to the car to go to the next exchange. 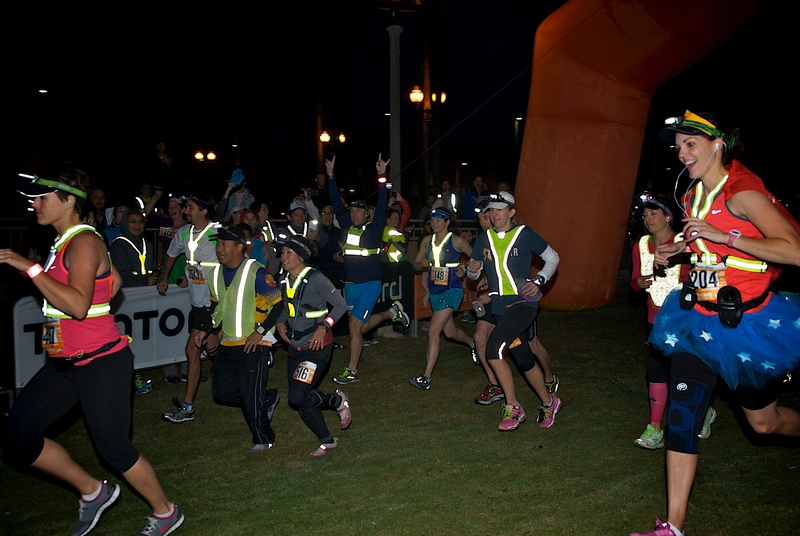 For all the night legs we were required to wear a forward facing light, a rear blinking light, and a safety vest while running. Anyone out of the van was required to wear a vest anytime they were out of the van. 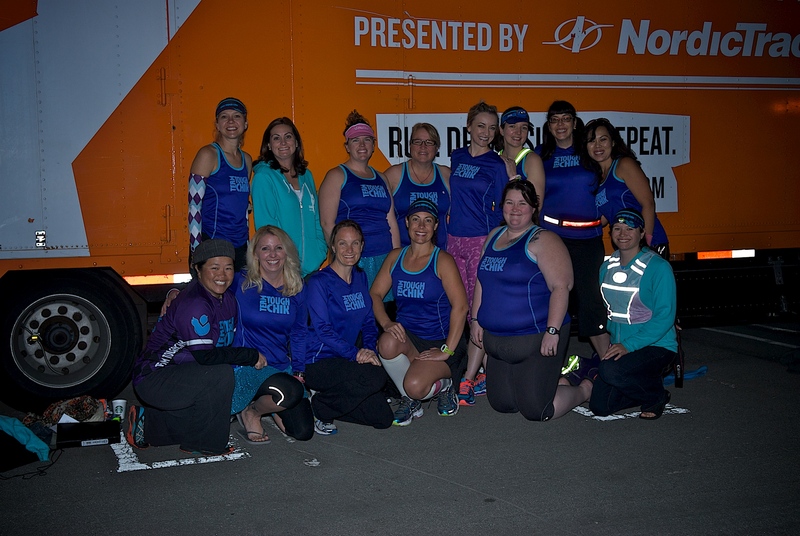 We had brought good running vests to run in but, also brought cheep construction vests that were nice to throw on when we were just out of the van. My night leg came quickly and I was excited to get it done with. 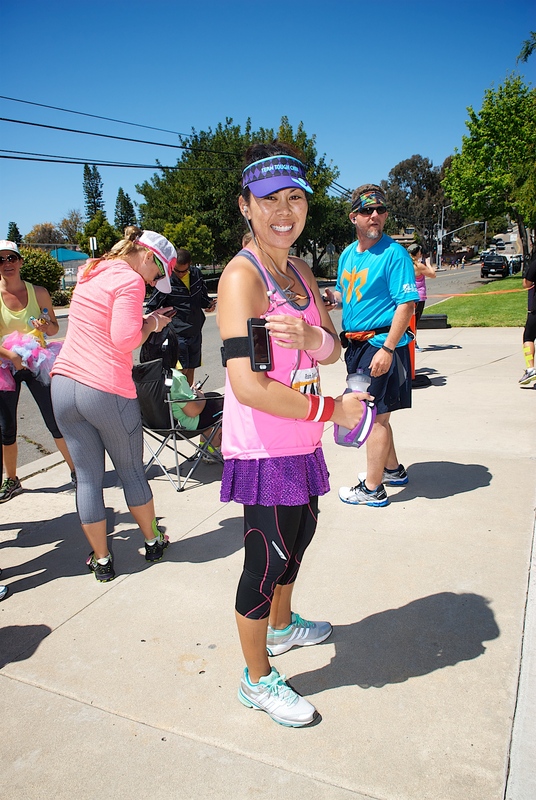 The Race Bible said my leg was 2.2 miles flat, so I knew I would do it quickly and without any issues. As I started my run I turned my first corner and all I saw was hill. Up the hill we ran, and then down a little, then back up, then down a little, then up some more. By the time I finally saw the “One Mile to Go” sign I couldn’t believe I was only half way. Thankfully after more up hill I finally saw the volunteer where we were to turn to go to the school with the exchange. As I was running to the corner I saw a Tennis ball in the gutter and almost stopped to pick it up for my pup. Finally we turned and ran up another hill to the school. 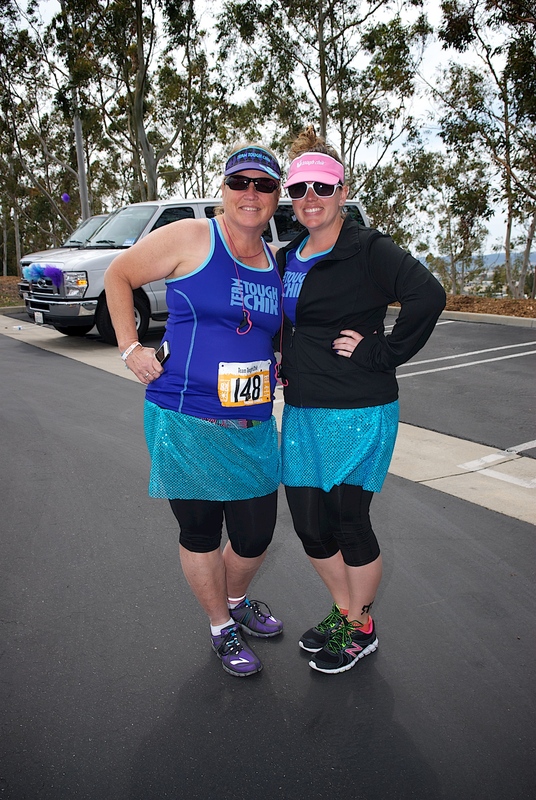 I was so thankful my leg was done and was so tired after not sleeping and running those hills. I was also feeling really sick. I had started feeling sick after my first run. I think it was due to dehydration and the not sleeping was just making it worse. Casey ran her leg, and Tina started hers. 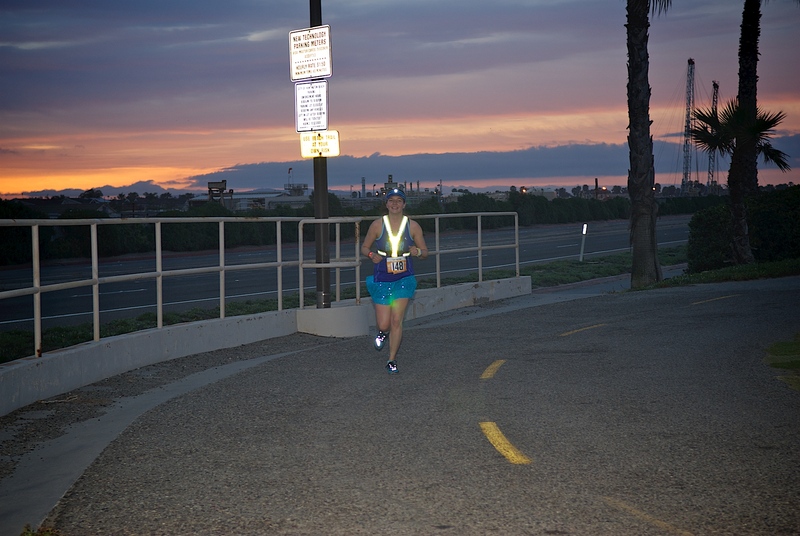 When Tina started her run we were looking at our clocks hoping that Tina would finish her run after the “night” hours. 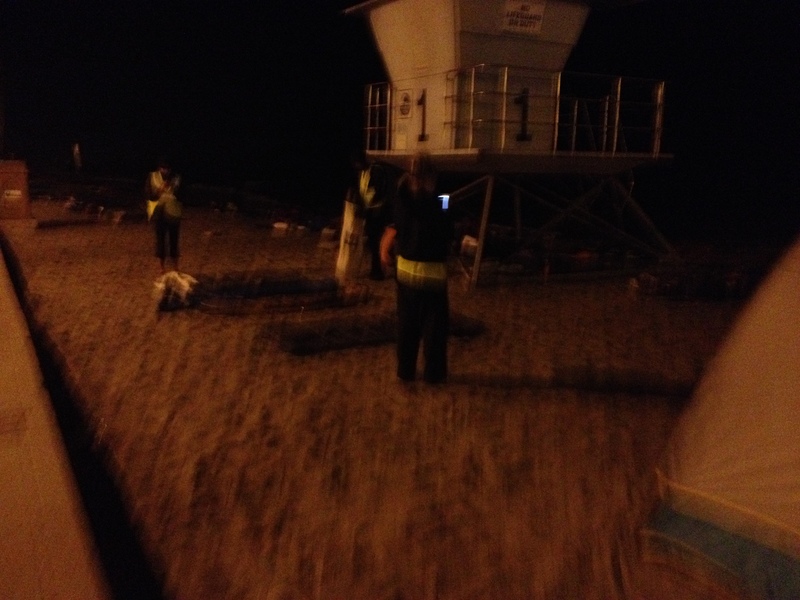 6:30pm- 6:30am were night hours and we were required to wear our night gear. 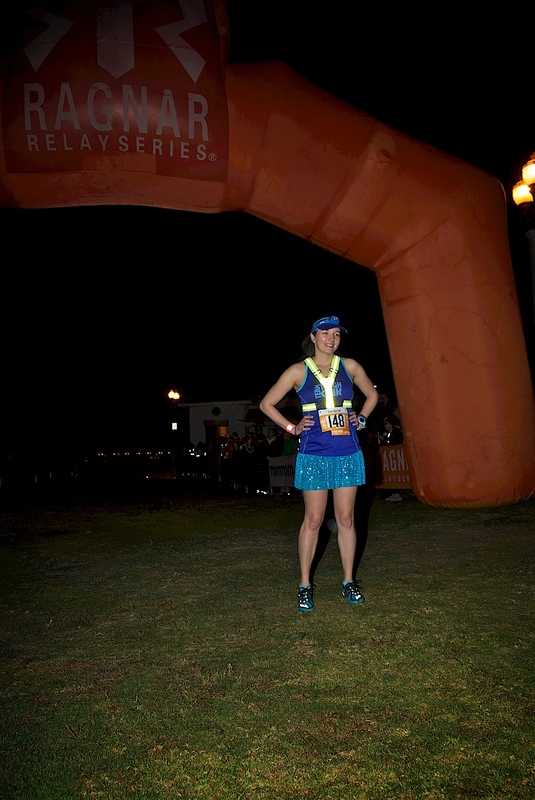 Lisa was estimated to have to run all of her legs in night gear and we really wanted her to have one run without it. 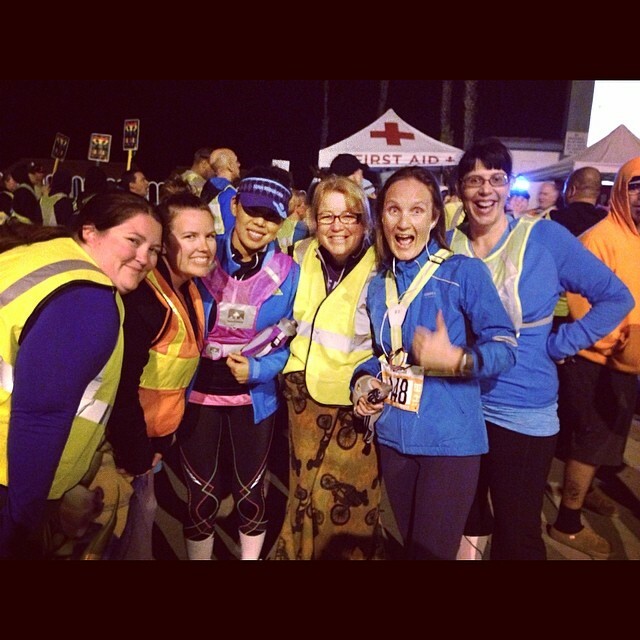 We met Tina at her half way point as we cheered and made an arch for every person that ran by. We were still really cold. I had my blanket wrapped around my like a towel and my jacket on and then my lovely orange vest over it. Next time I definitely need to bring warmer clothes. 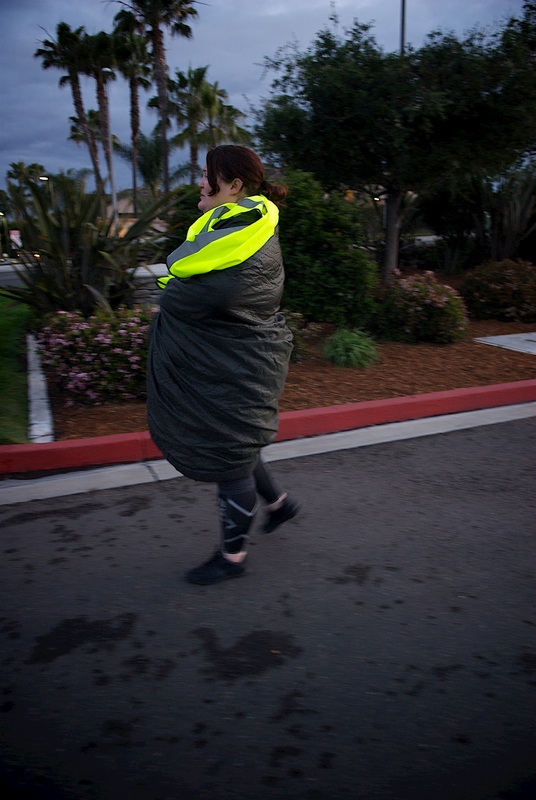 After seeing Tina and taking her night gear as it was 6:30 we headed to the next exchange. Once at the exchange we met up with the other van and got ready for Tina to come in. Finally she came in yelling for the bathroom and running off to the porta potty. Finally we were ready for some breakfast. We headed to Pipes Café in Encinitas and ate some delicious breakfast. I was still feeling really sick but was able to pick at some eggs, bacon, and fruit. After breakfast we headed to our final major exchange. Final legs and Finish coming up Tomorrow! 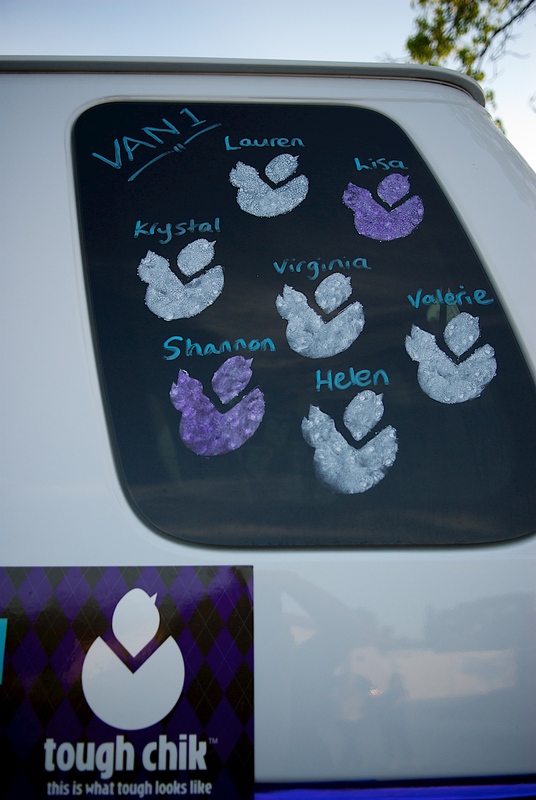 After meeting our Ragnar team on Thursday night and decorating the vans, everyone was so excited to start the next day. I went home that night and finished packing my things and got went to sleep, ready for the next 48 hours of craziness. 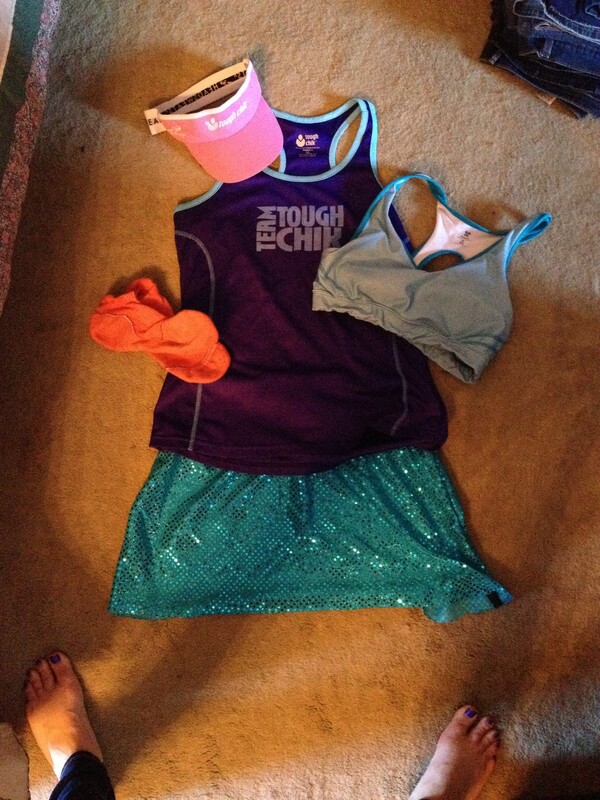 We woke up at 4:50am and put our first set of running clothes on. We were supposed to meet the team at 5:30 at the start line. 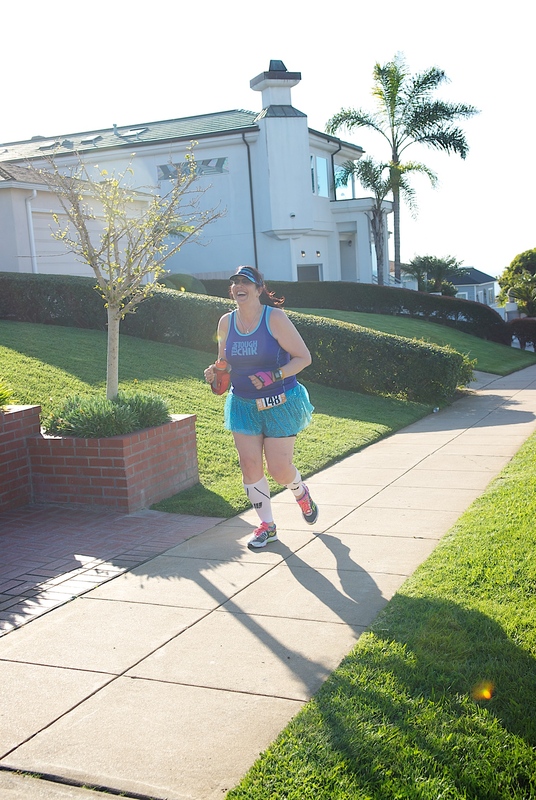 Julie was coming to our house and the rest of the team was meeting at Shannon’s to drive to the start line in Huntington Beach. 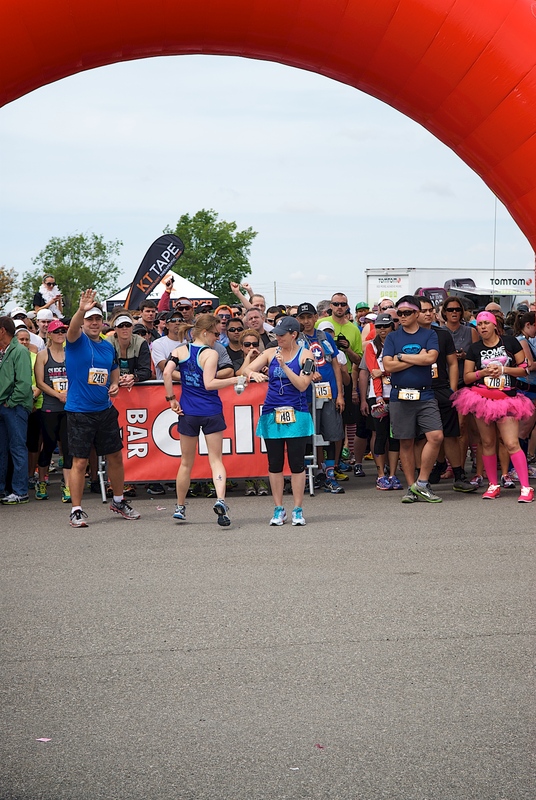 As we arrived at the beach and the start line, we noticed hundreds of huge white vans, all decked out in window paint and decorations ready for Ragnar. 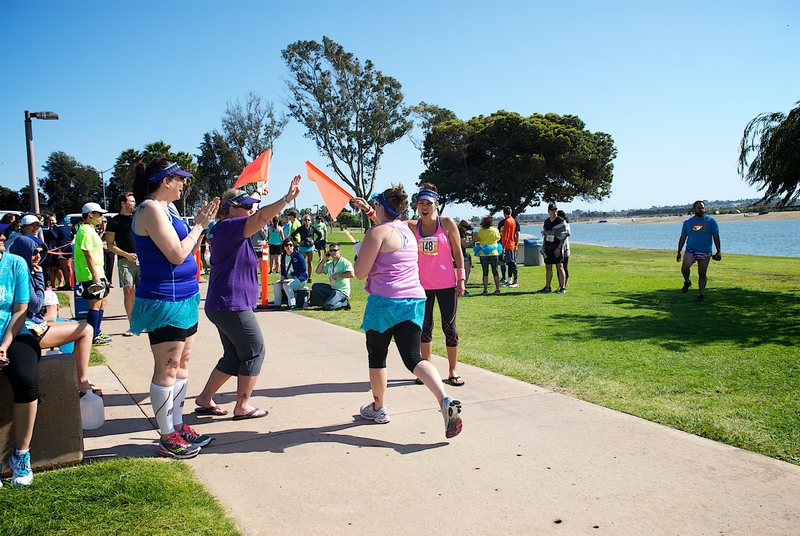 There was such an excitement in the air as everyone couldn’t wait to start their race. 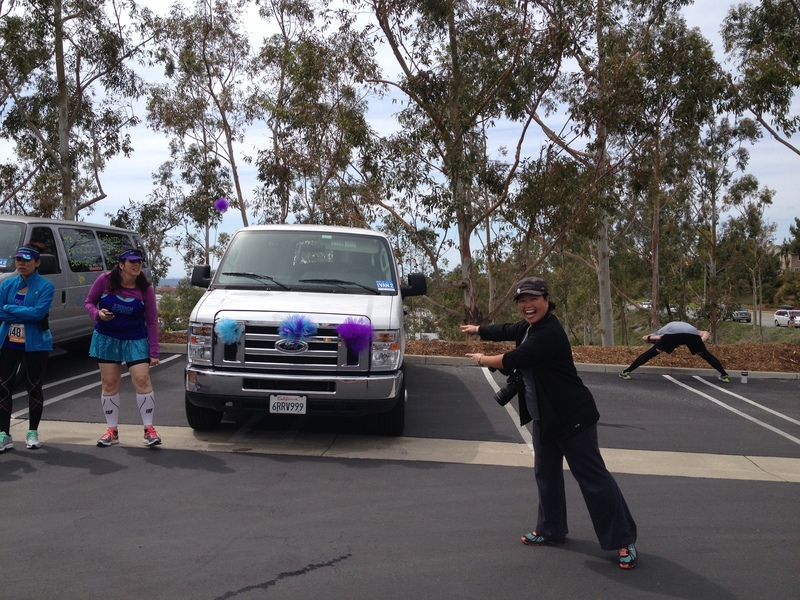 The girls from our van helped Van 1 check in and get ready for their first legs. Lisa was ready for the start at 6:15 and got ready for the 6:15 wave. After more pictures we were so excited and ready to begin. Lisa started and we were off to the vans. Van 1 was to go to the next transition and our plan was to go eat some breakfast. Van 2 didn’t have to run until later so we had time to kill before getting to exchange 6. 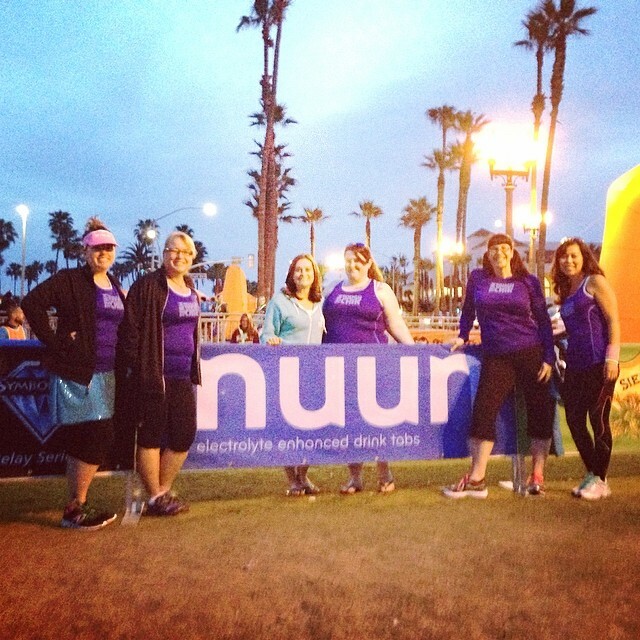 Nuun was a great Sponsor and set us tons of Nuun and water bottles for Ragnar! so we had to take a picture with their sign! 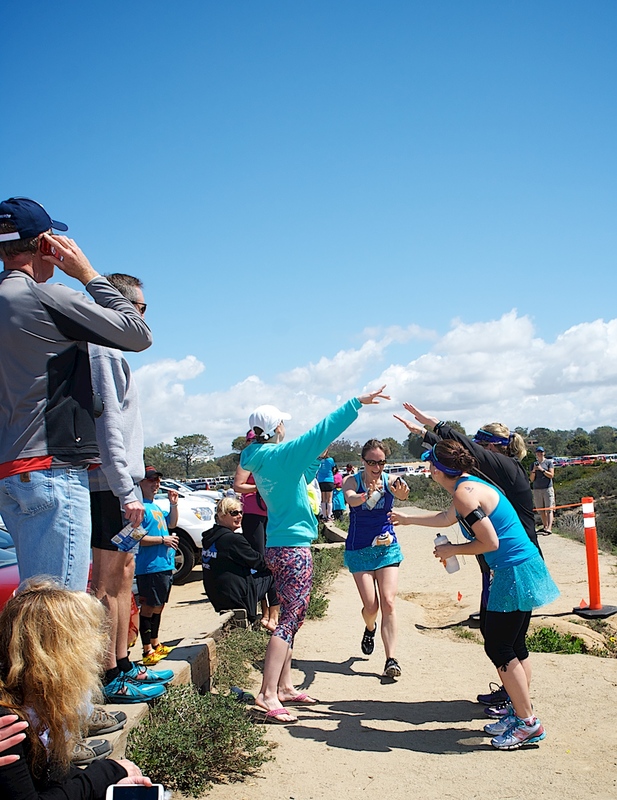 We drove down the coast a bit and stopped near dog beach so that we could cheer Lisa on as she ran. We cheered everyone on and they ran by. 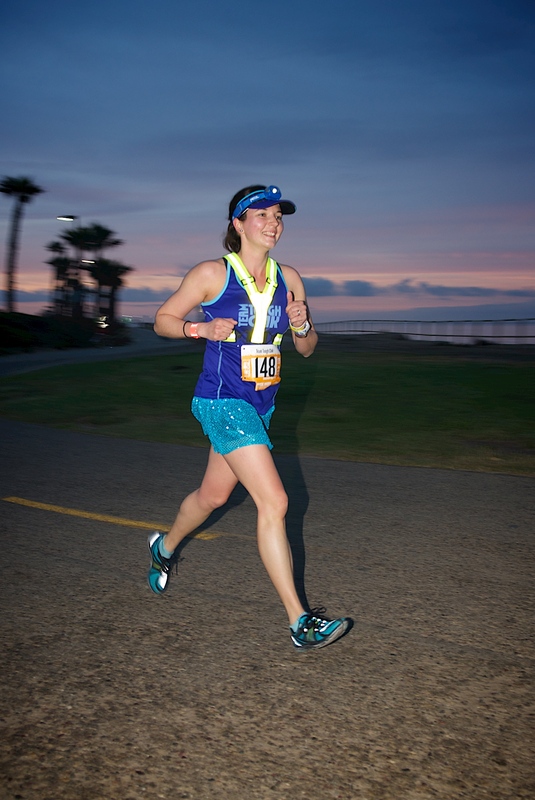 It was fun to meet Lisa on her first leg and watch the sunrise at the beach. 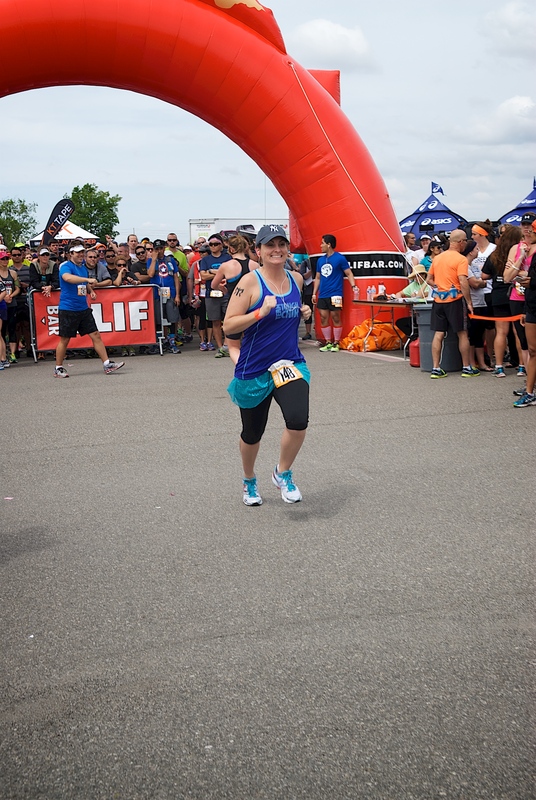 Lisa running by as we cheered! After cheering on Lisa our Van headed to Coco’s to get some food. We ate plates full of bacon, eggs, and pancakes and then headed to our house to use the bathroom and print out some stencils for the van. 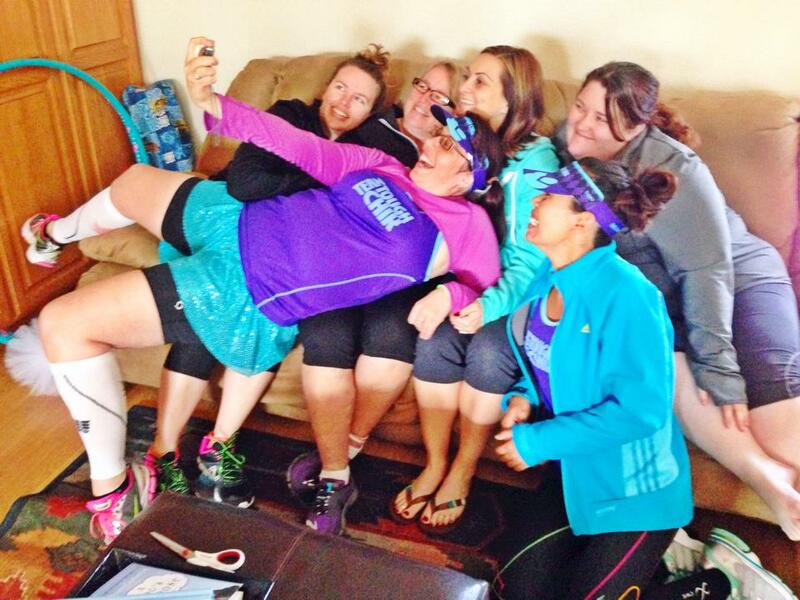 It was fun laughing and taking pictures at the house to prepare for our legs. 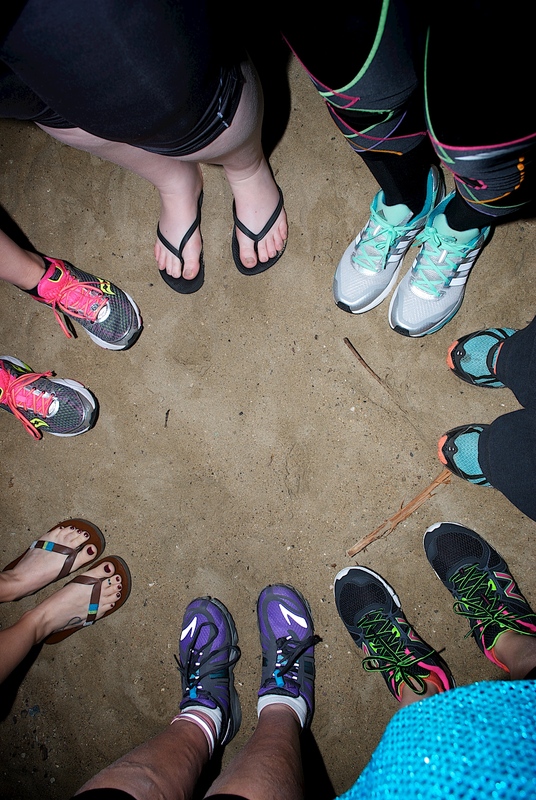 We decided we wanted to see if we could catch up with a few other Van 1 runners before we had to get to our exchange. 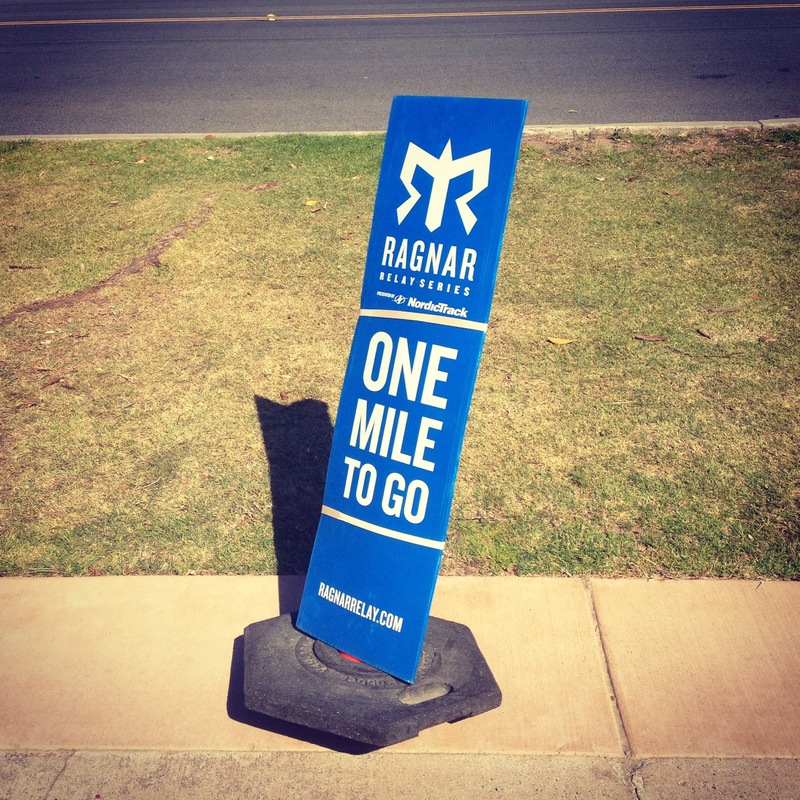 We headed towards Mile Square Park to follow the Ragnar route and look for runners. 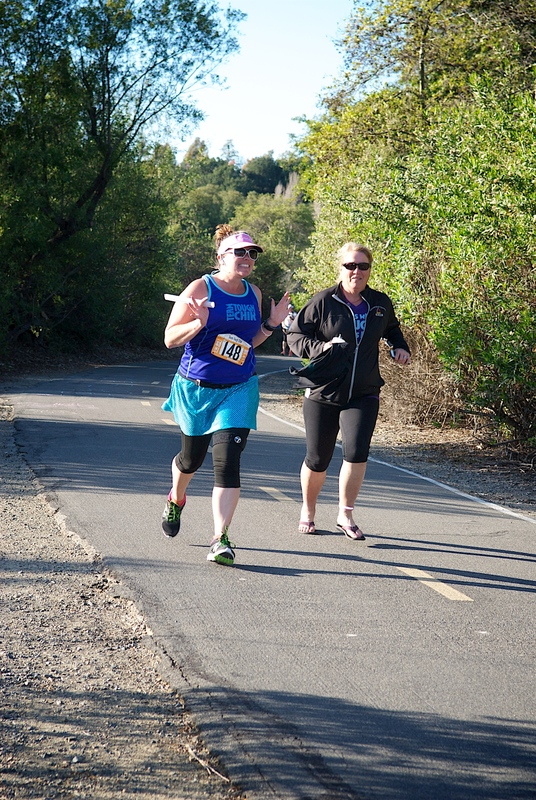 Eventually we found Virginia running and yelled and cheered for her. We drove up a little ways and stopped to cheer her on and see if she needed anything. Getting a Selfie with Virginia at the light! 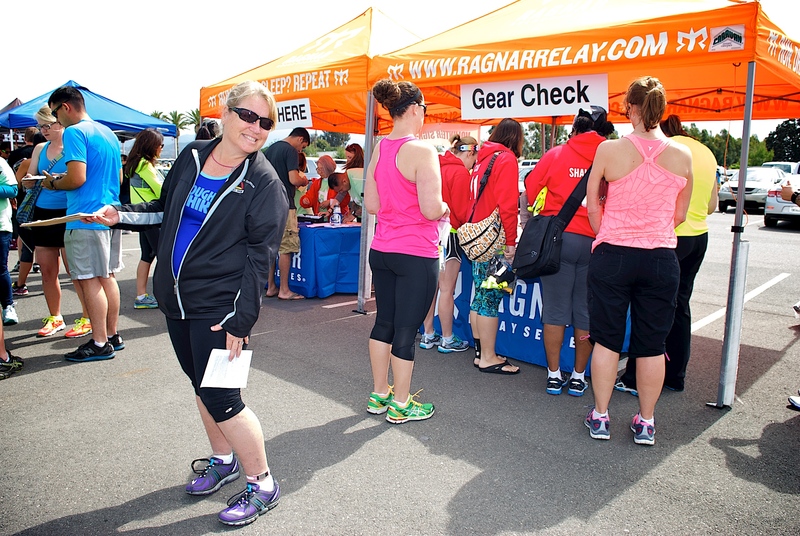 One of the most fun parts of Ragnar is getting out of the vans and cheering for people. 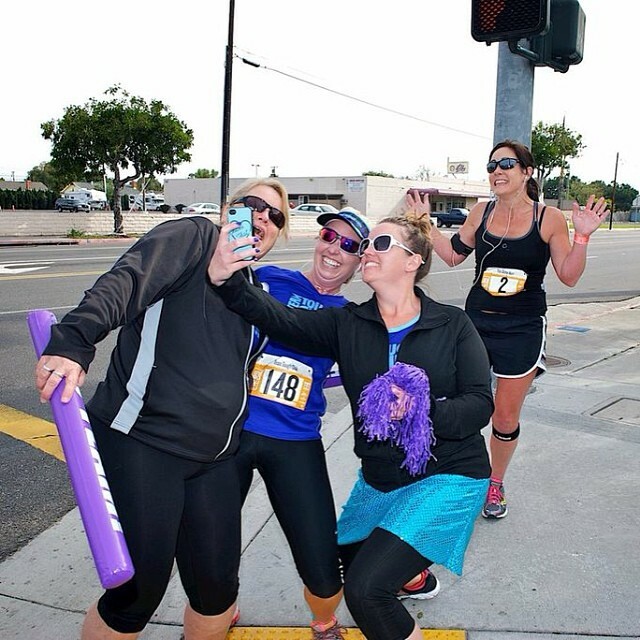 We always made sure to cheer on every runner that came by. 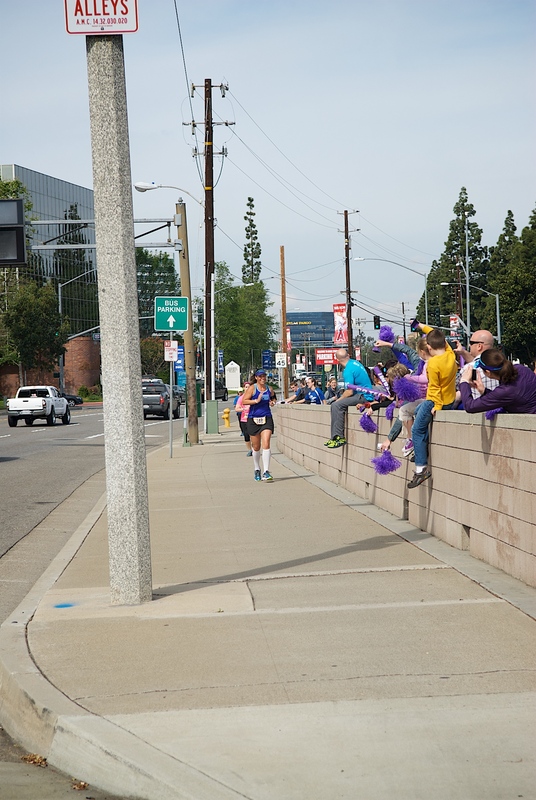 It was great to see the smile on people’s faces as we cheered for them. 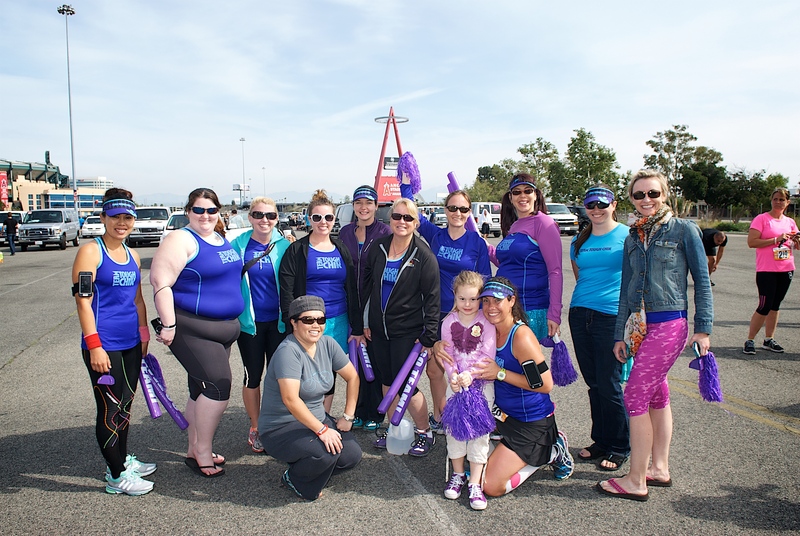 After stopping for Virginia we drove to Angel Stadium so we could catch up with the group one more time before heading to our start. 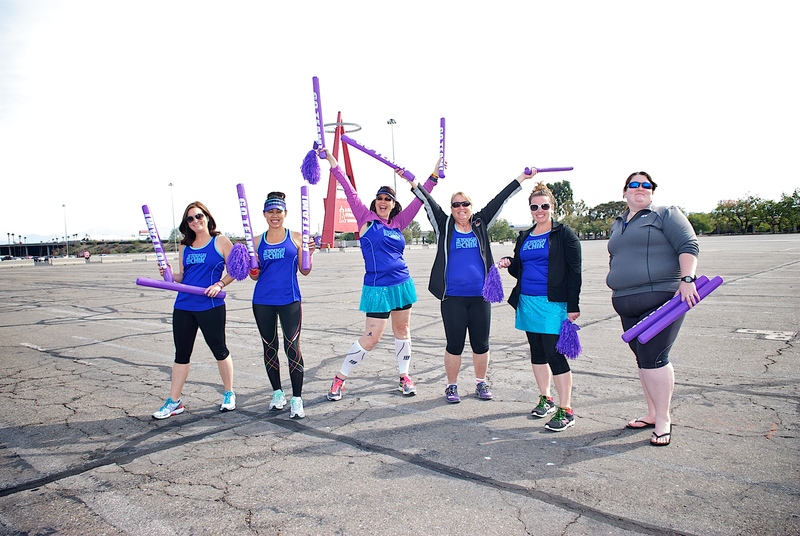 At Angel Stadium we cheered, took pictures, tagged vans, and had fun watching all the Ragnar craziness. Soon Van 1 arrived and Valerie was on her way to the exchange. As soon as Valerie came in Shannon was off on her first leg. 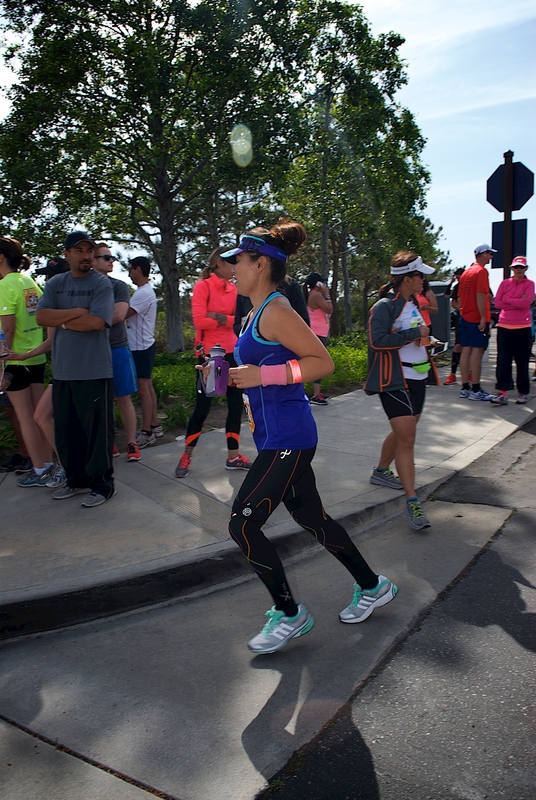 Valerie’s family was waiting for her as she finished and it was great to meet them and see their excitement for her. Her daughter is a little “Toughie” in the making. At Angel Stadium waiting for the other van! All but Shannon who was running at the time! 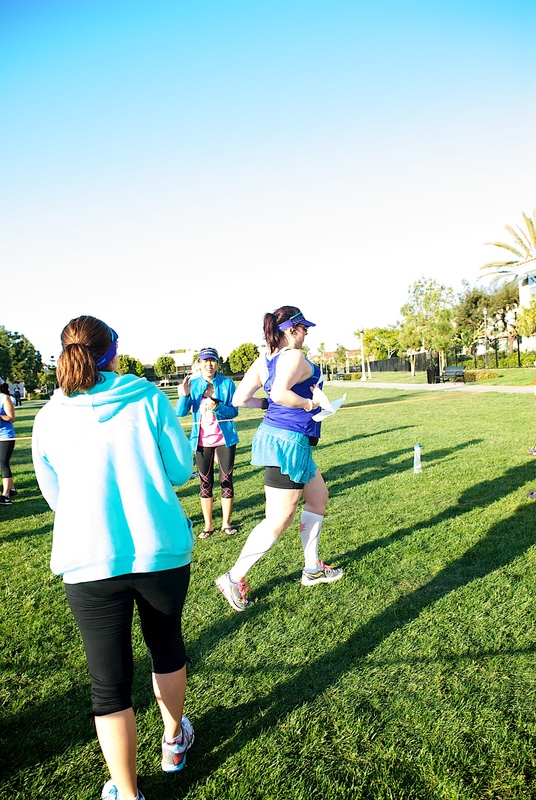 With Shannon running we had to head to the Great Park for our first exchange and to check in. At the Great Park there were so many people and vans. We were so excited and getting more excited every moment. Funny thing with being Van 2 is the nervous, excited feeling you get before a race sticks with you for hours and hours until you finally start your first leg. After checking in we listened to our safety briefing, where they told us all the safety rules that we needed to know. Once we listened to the Safety briefing we got our flags and shirts and did a bit of shopping. 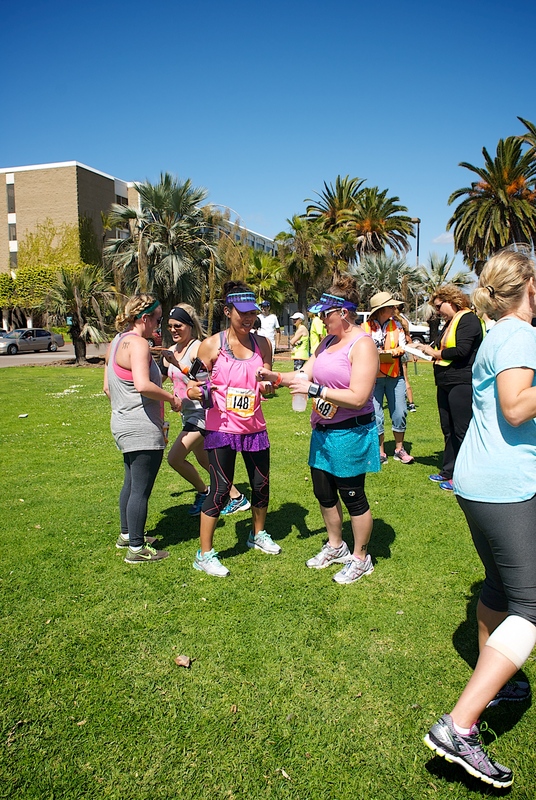 This major exchange was full of energy as people were waiting to start their leg. 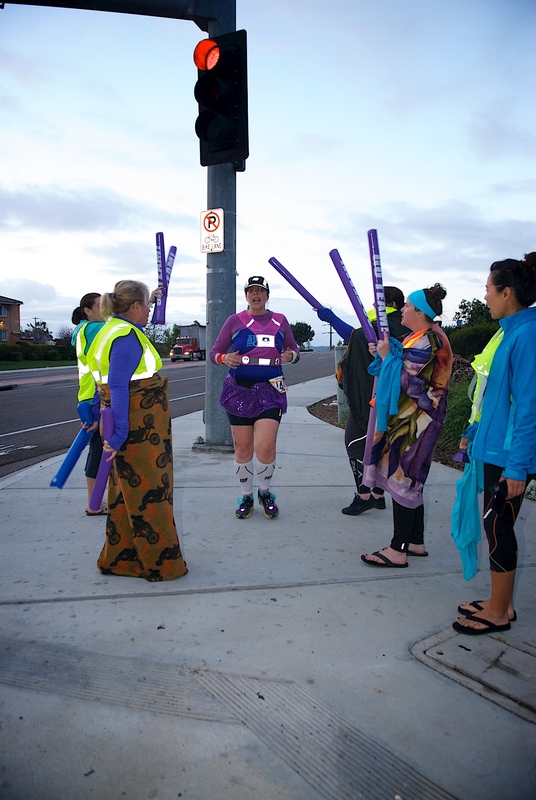 Once Van 1 arrived we hung out with them and made sure Amy was ready for her first leg. Soon we found out the Helen was near and we went near the start to cheer for her and wait for Amy to start. 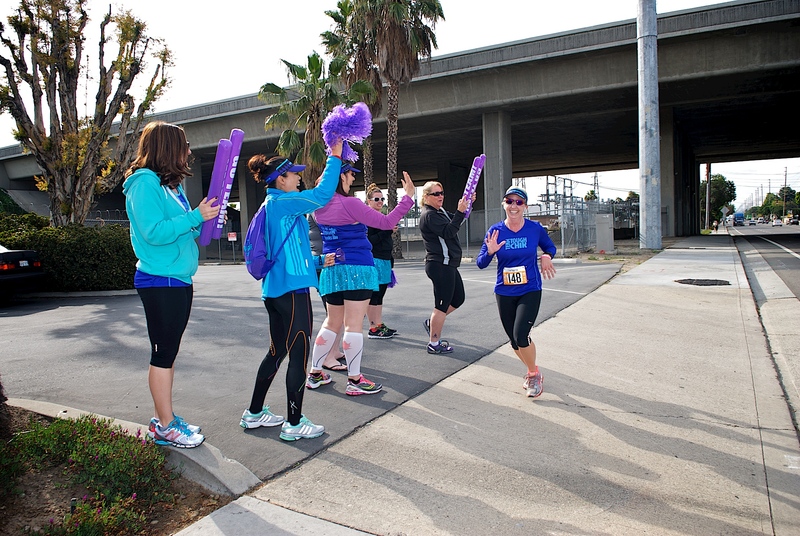 As Helen came in we cheered and cheered and watched as she passed the slap bracelet to Amy and Van 2 was off. The great park was CRAZY. It took is an hour to get out of the parking lot. While waiting to get out of the parking lot the Ragnaliens (my dad and uncle’s team) passed us going into the park. 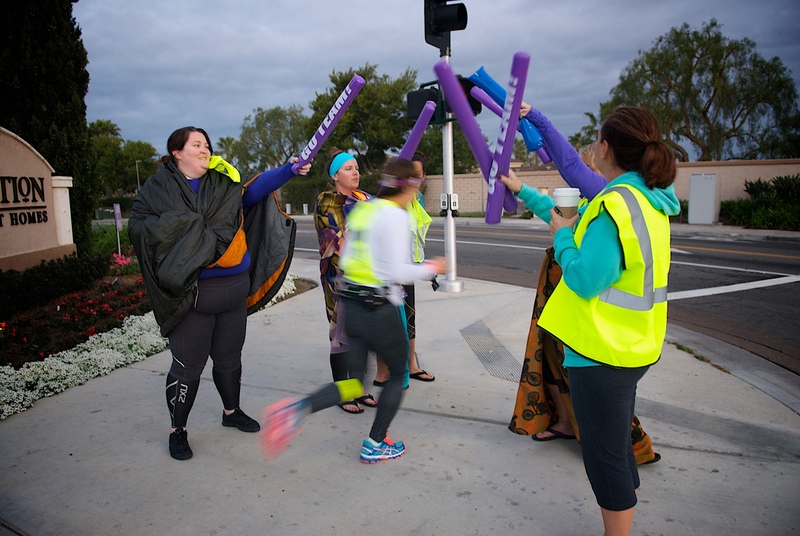 Amy asked us to meet her at mile 3 and 6 of her 9 mile leg to give her some water. 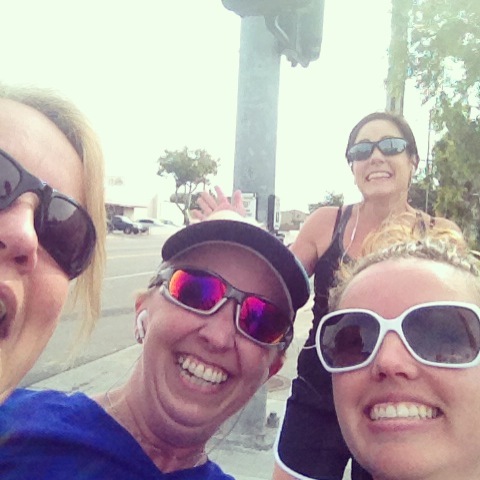 We missed her at mile 3 as we were sitting in the traffic but found a place to meet her around mile 7. We stopped in the Asics parking lot and cheered for Amy and the other runners. We gave her water and headed off to our next exchange to get my mom ready for her leg. Mom’s first exchange was at a small church. We arrived and got through the craziness of the parking lot. Julie did a great job of getting us through the cars and an amazing job at parking that beast. With Mom read for her run we waited for Amy to arrive at the exchange. 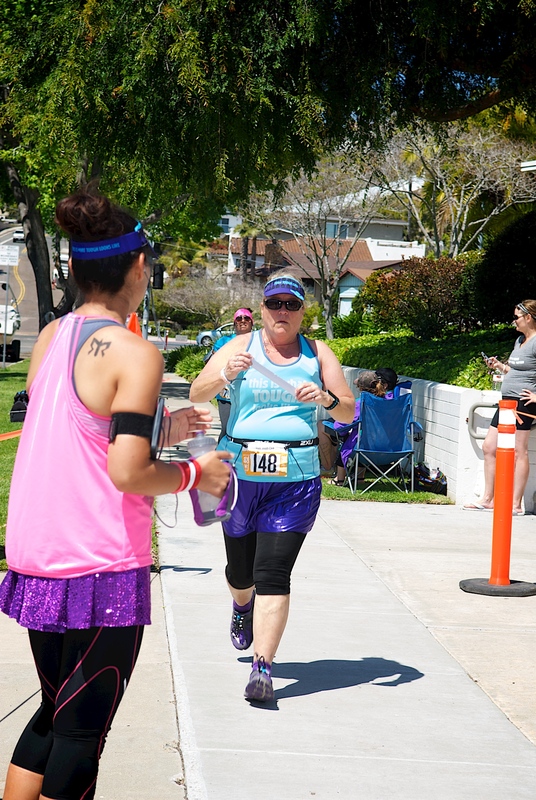 Finally Amy came and slapped the bracelet on my mom and she was off on her first leg. 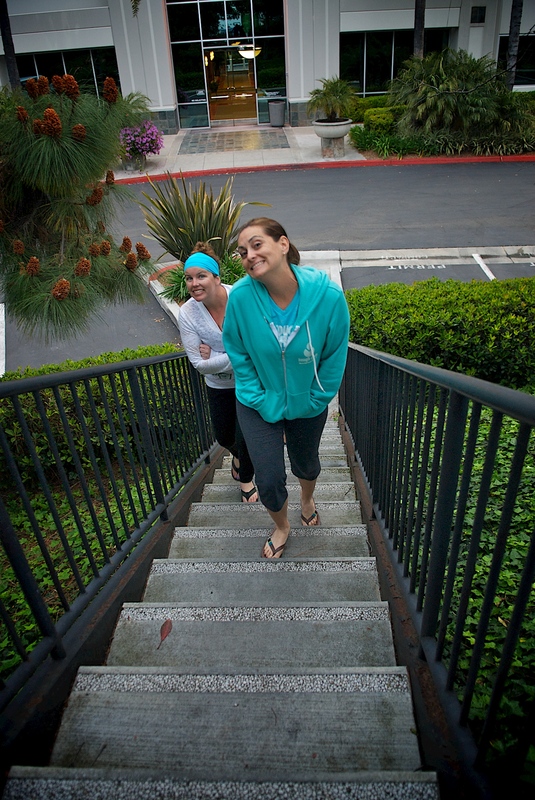 With her off and Amy recovering we started toward Saddleback church for the next exchange. As we were driving into the parking lot we remembered that we needed to get ice so we drove back down Glen Ranch (slowed to cheer my mom on) and stopped at a gas station to get ice and cold drinks. As we drove back into the parking lot we noticed my Aunt Cyndi standing on the corner as a volunteer! 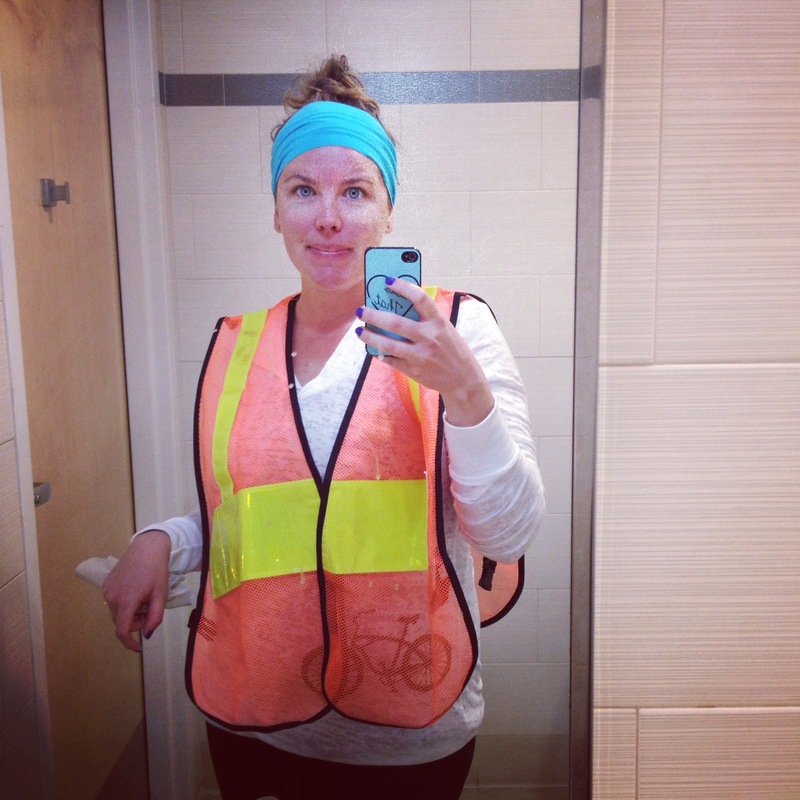 Once parked Kathy got out and got ready for her first leg. As she was getting ready Julie and I walked over to see my aunt and watch for my mom to come in. As we walked over we found my mom standing there waiting. OOPs. I ran to find Kathy and told her my mom was already waiting. 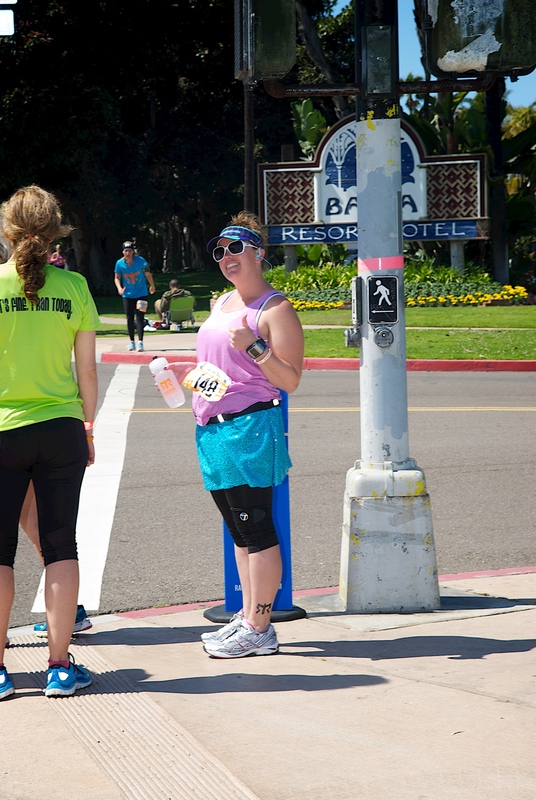 We ran over and my mom slapped the bracelet so Kathy could start her first leg. 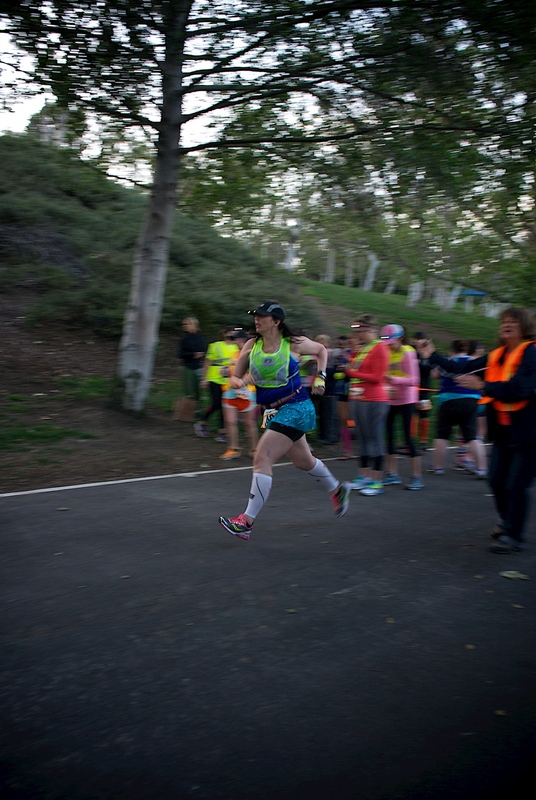 Once Kathy was running her leg we headed to the next exchange to meet her. My leg was next. As we drove to the exchange I started getting ready and was feeling really nervous. 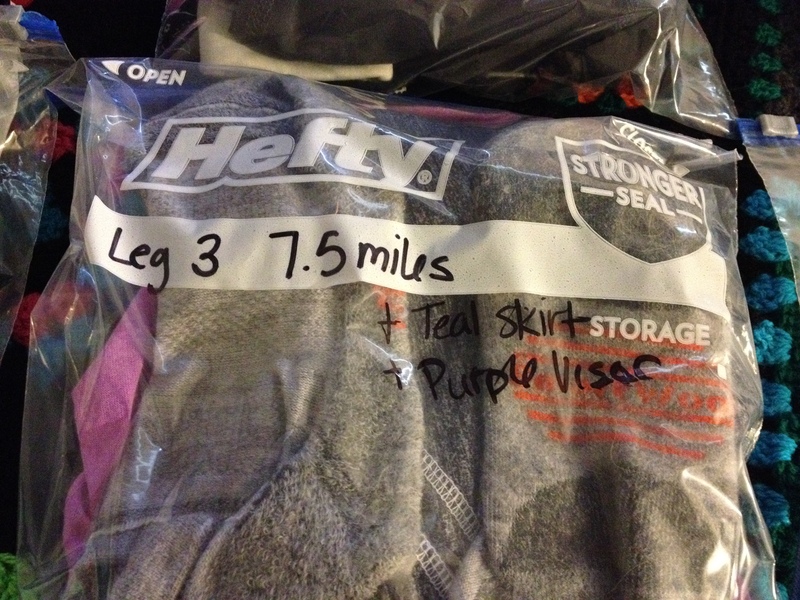 This leg was 6.7 Miles unsupported. 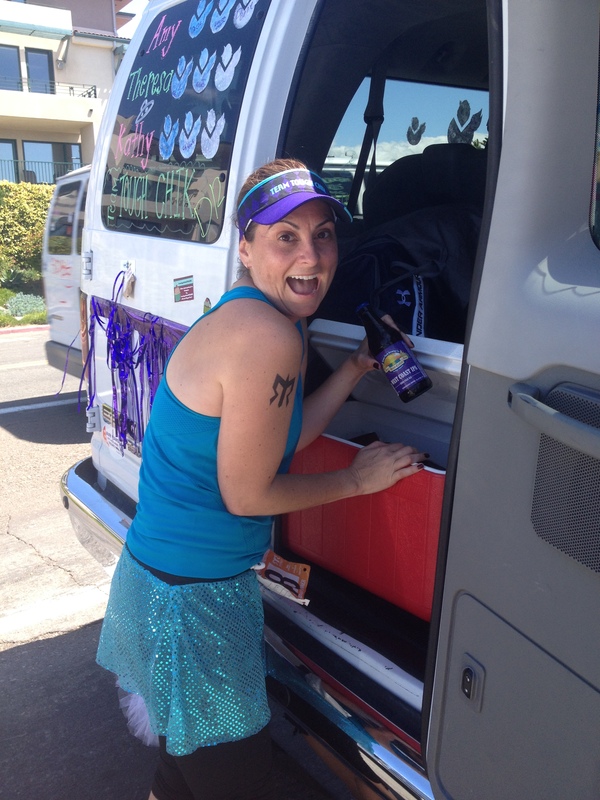 Unsupported means that the van was not able to stop on the course and cheer for me or give me water. 6.7 Miles was a really long run to have no support. As we arrived at the exchange I finished getting ready and went to the bathroom one last time. Once I was ready and we thought she would be coming soon we walked to the exchange. This exchange was kind off the side of the road. We waited for Kathy to come as I got more and more nervous. At this point I was just ready to start running. Finally Kathy arrived and I was off. Well I was off for like 100 feet until I got to the stop light. Once the light was green I had to wait for another stop light so I could actually start running. Finally I was off and heading to the trail. 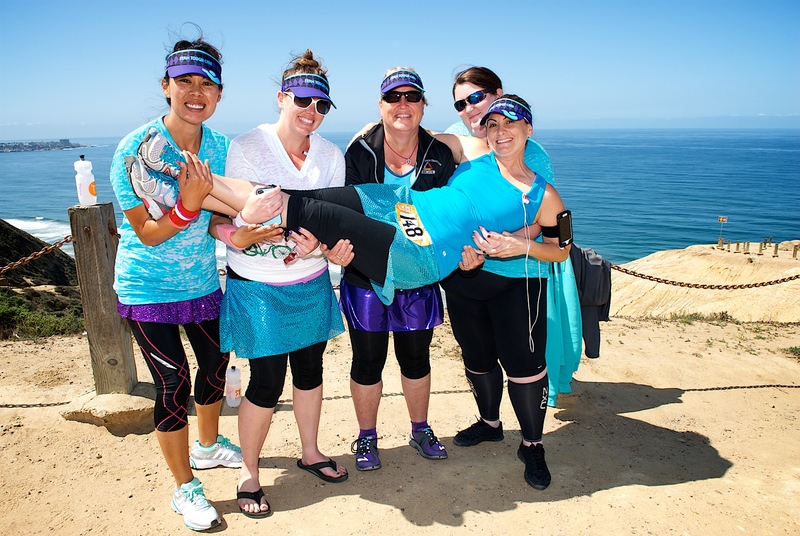 This leg was on the Aliso Trail. 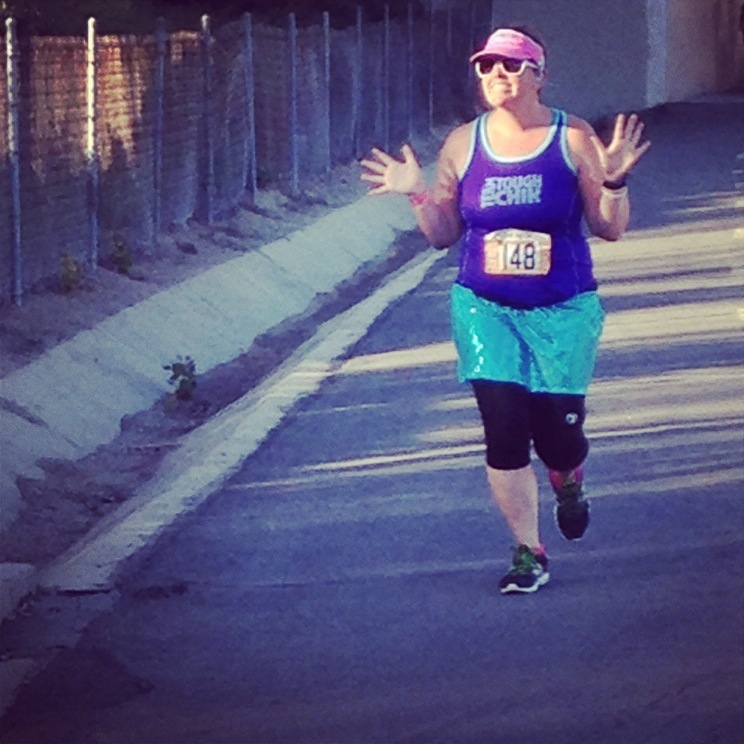 I was a beautiful run and I was feeling really good. I got really bored pretty quickly though. Without people cheering for you or other people with you it’s just not the same. At one point a rabbit passed in front of me and I got so excited. Finally I hit the water stop and was hoping that I was at mile 4. I ran and ran and ran. I was so worried that my uncle was going to pass me on this leg. I really didn’t want to get passed by him. After what seemed like an eternity running by myself I finally saw my mom standing at a corner. When I saw her I was so excited! I knew I had to be almost finished. She started to run with me and finally I saw the exchange area. No One mile to Go marker. After a super narrow right turn I saw Casey and slapped the bracelet on her wrist! I was so thankful to be done. So happy to see someone! 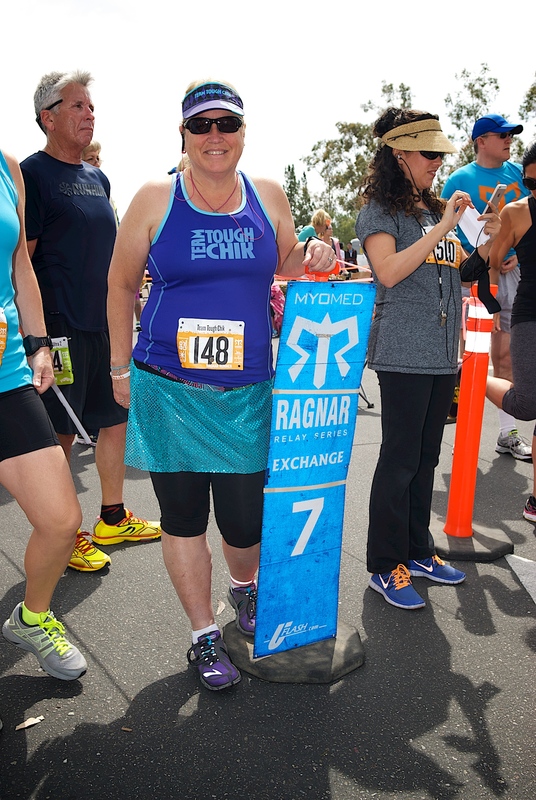 Casey finished her leg and the Ragnaliens caught up with us at the exchange. 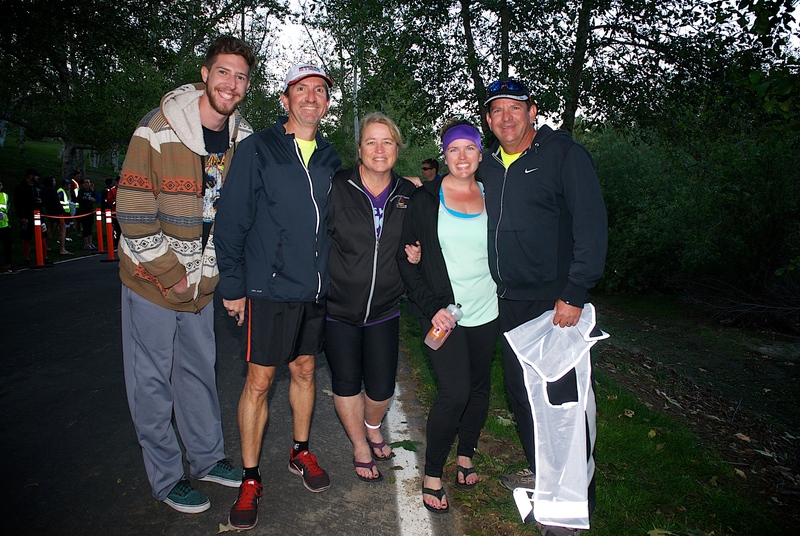 As we started Tina off, we watched as my cousin Cameron finished his leg and their last runner Melissa started hers. 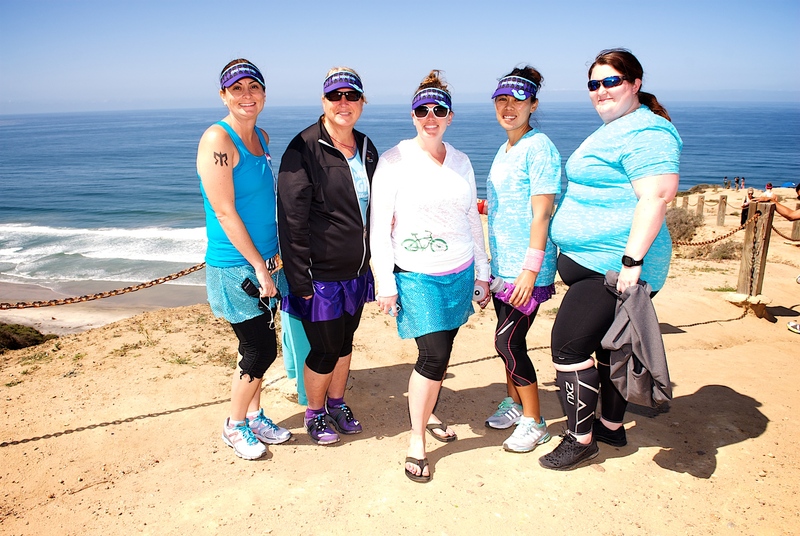 Then we were off to the major exchange point at Doheny State Beach. Part 3 hopefully coming tomorrow!! Part 2 of my blog is coming soon but here is a little highlight video for you while you wait! 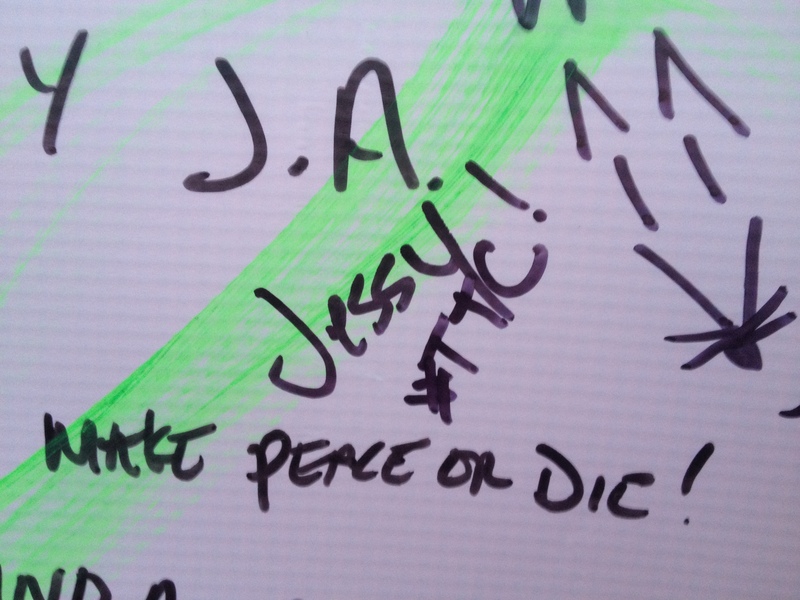 Well there is so much to say about our Ragnar Relay experience. 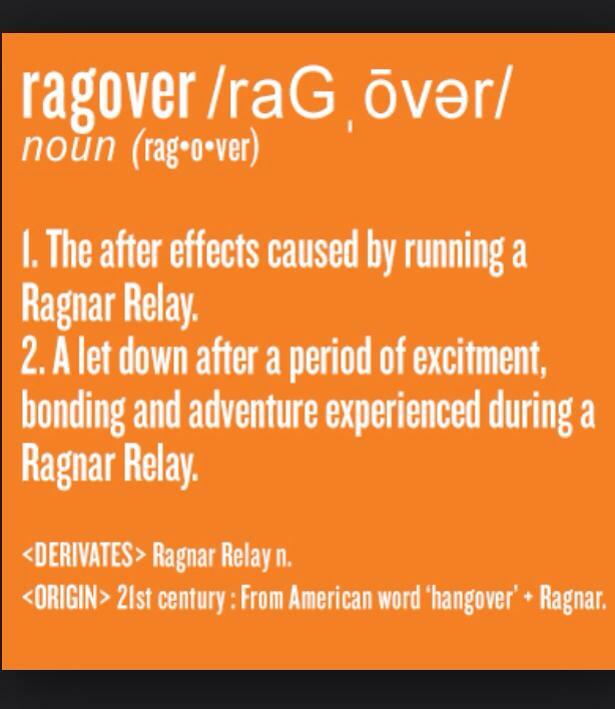 I can’t believe Ragnar is over. I am definitely going through withdrawals! It was one of the best experiences of my life and I am so happy I got to do it with my family! 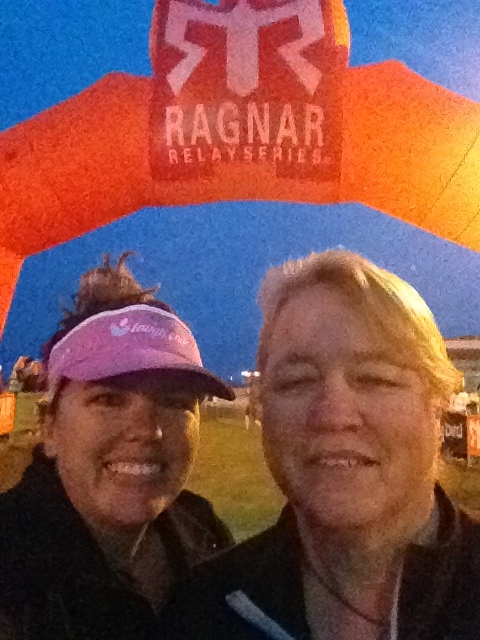 As you know we have been training for months for Ragnar Relay. 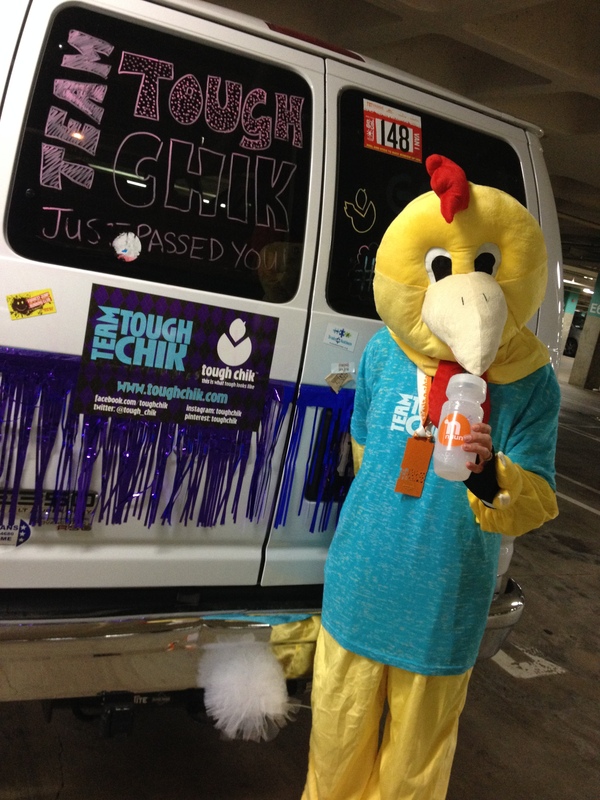 My mom and I were on Team Tough Chik. 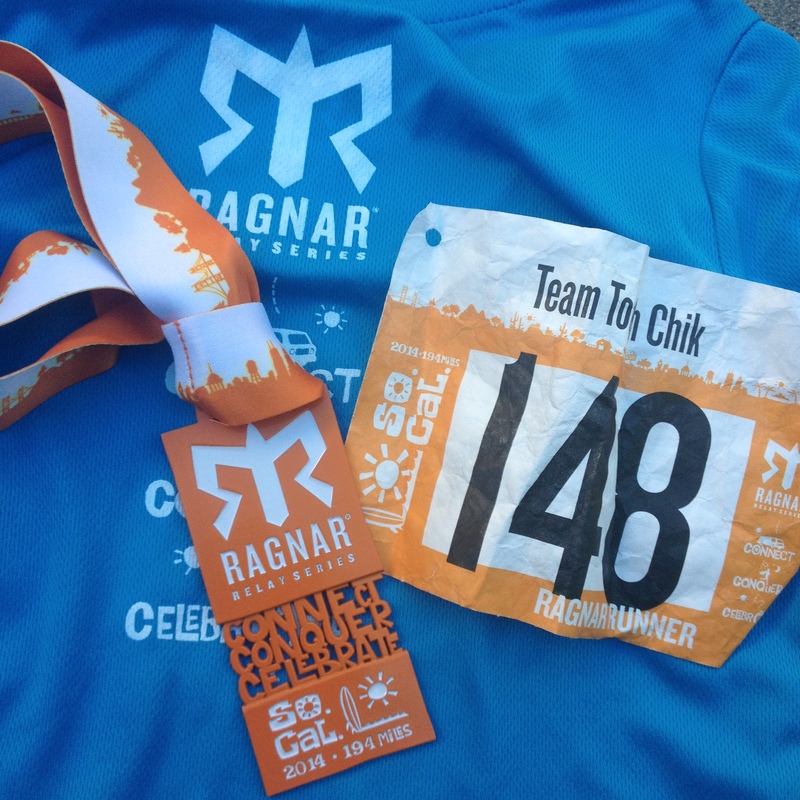 We couldn’t decide whether we were more excited to run Ragnar or meet the other chiks? Either way as the day approached we got more and more excited! We had created a face book group that was essential to our team. With people living all over the place and most of us never meeting before, Facebook was our main communication. Through facebook we were able to plan costumes, make sure only one person per van was bringing big items, and discuss logistics. I felt like my running training was going well. I would have liked to get a few more back to back long runs in but, I was feeling good on the running side of things. Our Mojave trip was great training for long hours in a car, getting dirty, and going to the bathroom where ever you can. We felt pretty well prepared. Well as prepared as you can be for first timer. 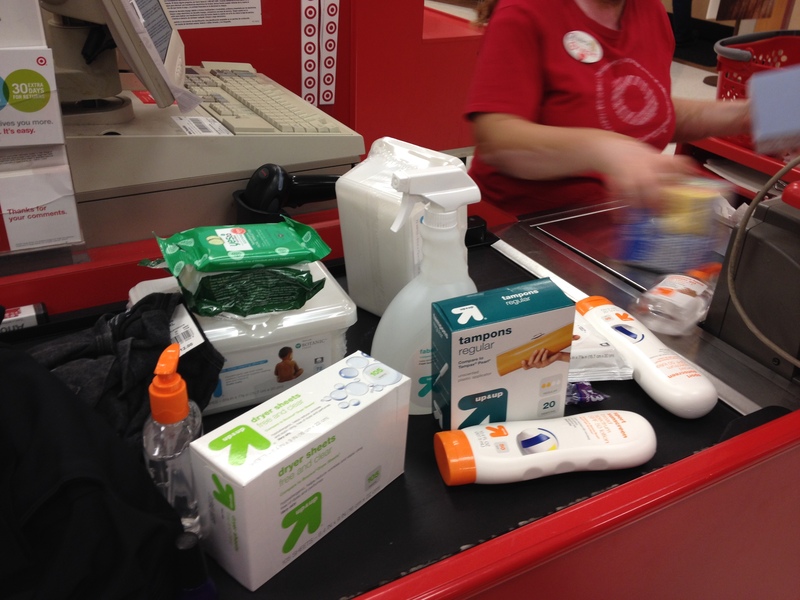 A few weeks before the race mom and I went to Target and stocked up on essentials for both vans: baby wipes, tissues, hand sanitizer, hair ties, dryer sheets, trash bags, fabreeze, paper towels, sunscreen, tampons and whatever else we could find. 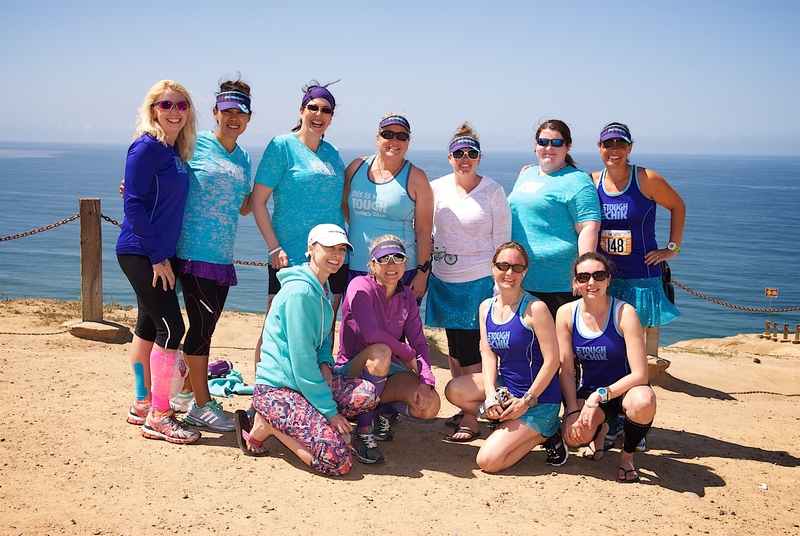 We ordered cowbells and party supplies online, gathered reflective gear, and found anything else that could possibly help us through the race. A few weeks before the race Shannon and I went to the team captains meeting in San Diego. This meeting was great to familiarize us with rules and course changes. 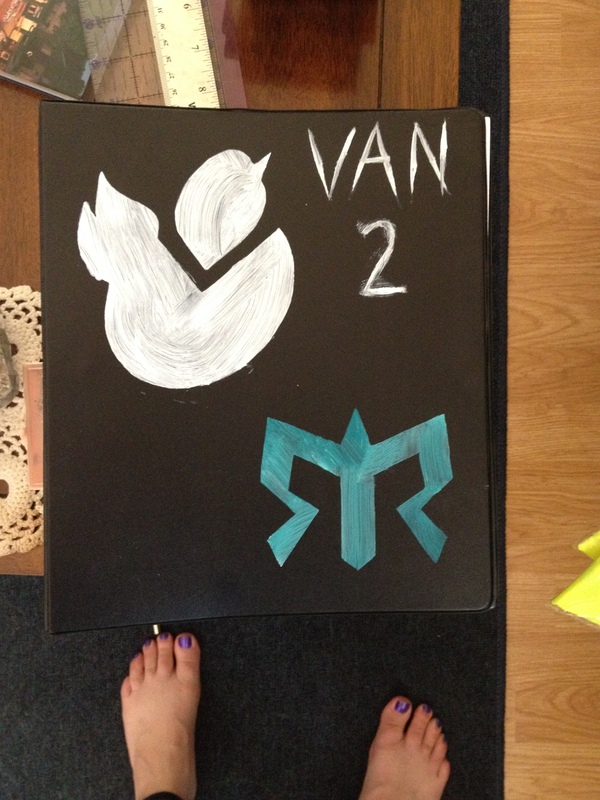 The week of I made some stencils so we could draw our “chik” logo on the vans, and made binders for the vans. 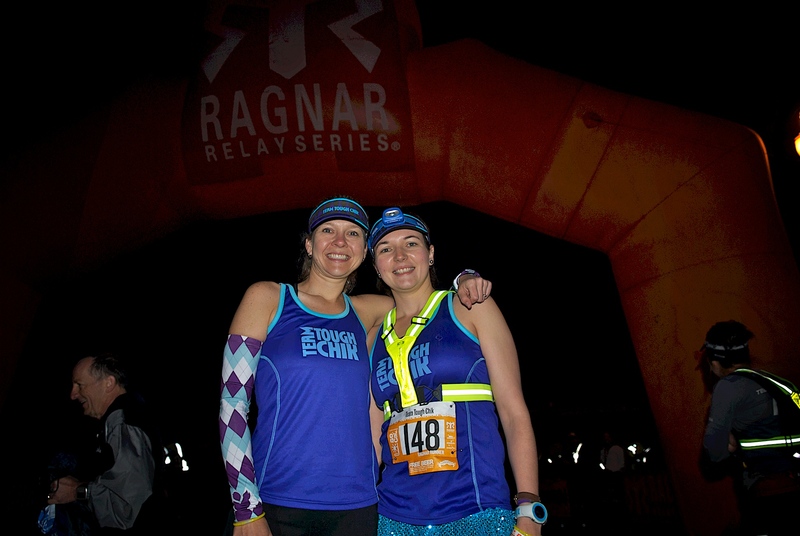 In the binders would go our “race bible” (all the rules and information about Ragnar), our cell phone list, and emergency contact information, legs maps, and our end of race shower information (more about that later). 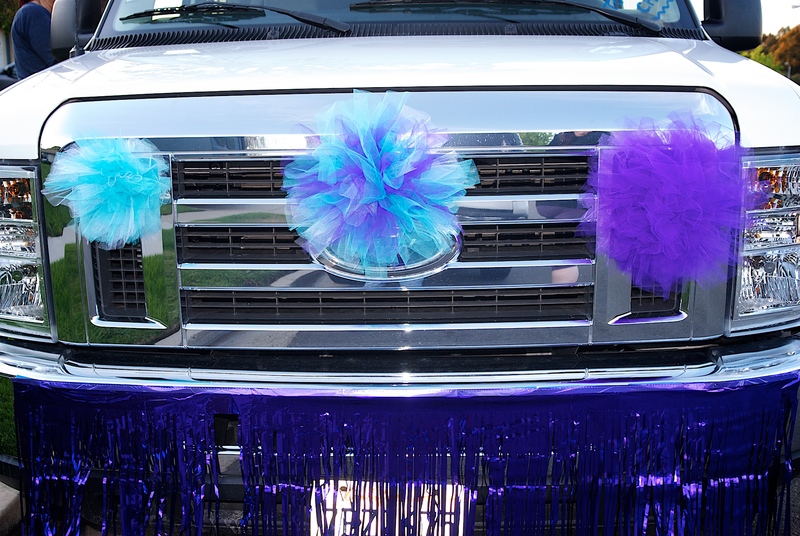 I made a few other decorations that would be able to go on the vans as well. 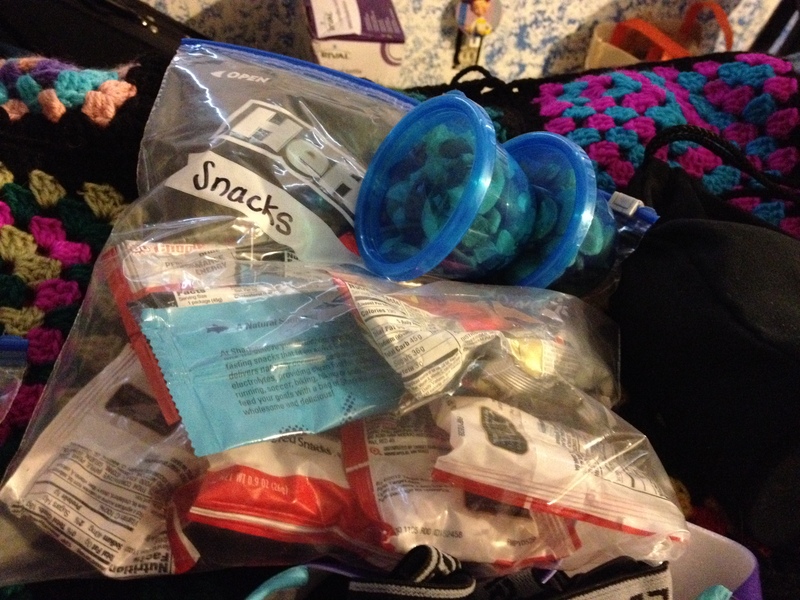 A few days before, I started packing my bag. 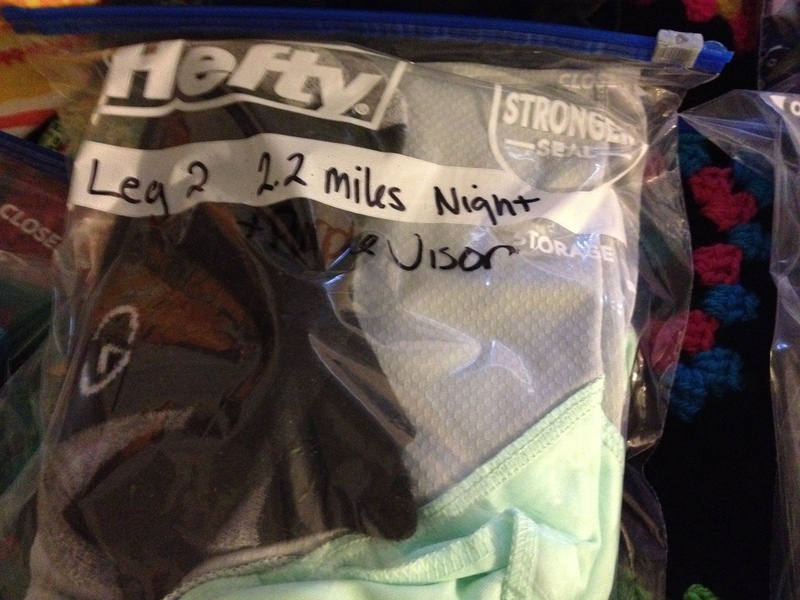 I learned from a lot of different blogs how to pack for a Ragnar event. 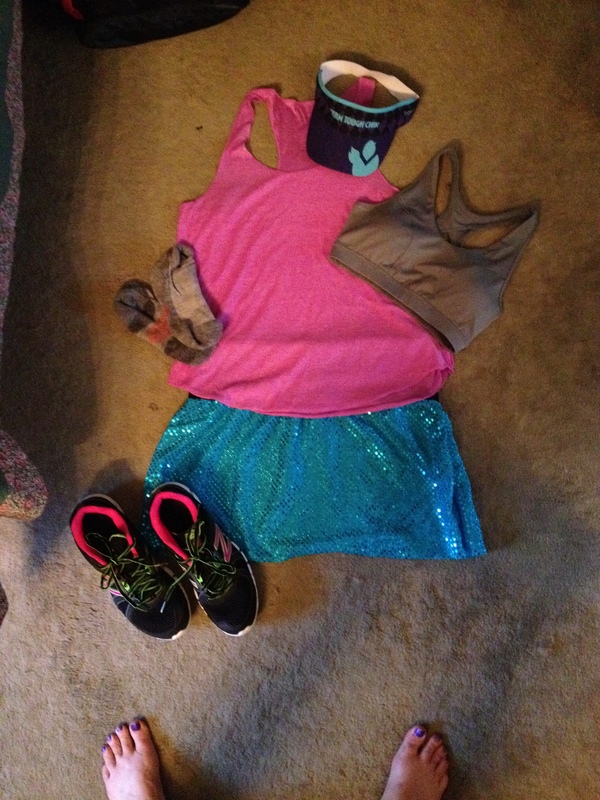 Most people said to pack each outfit in a separate Ziplock and make sure all your night gear is together. That is exactly what I did. 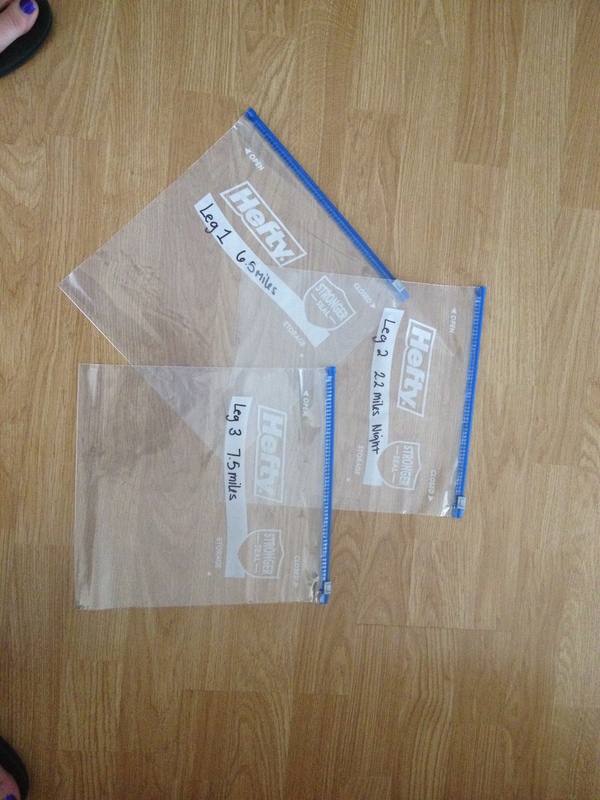 I had a bag for leg 1, 2, and 3. 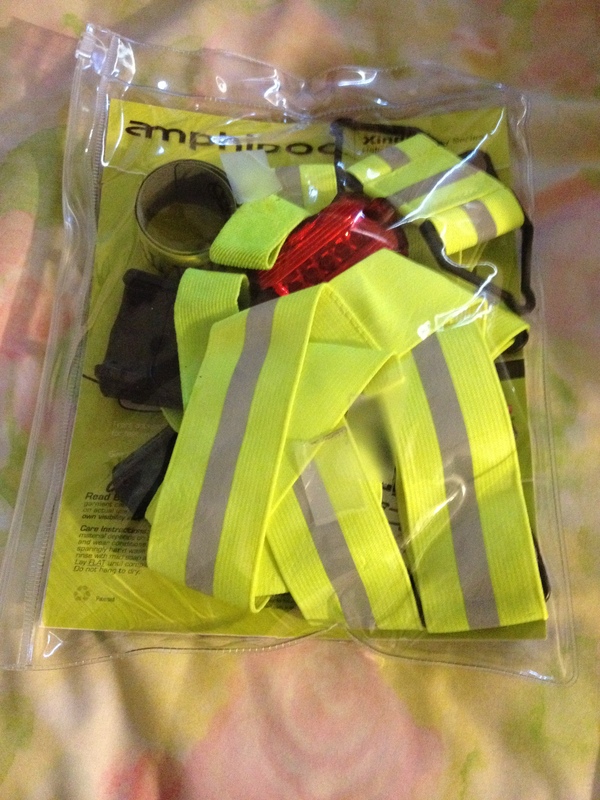 I had a bag for my night gear (headlight, taillight, vest), a bag for my after clothes, and I made a bag for just in case. 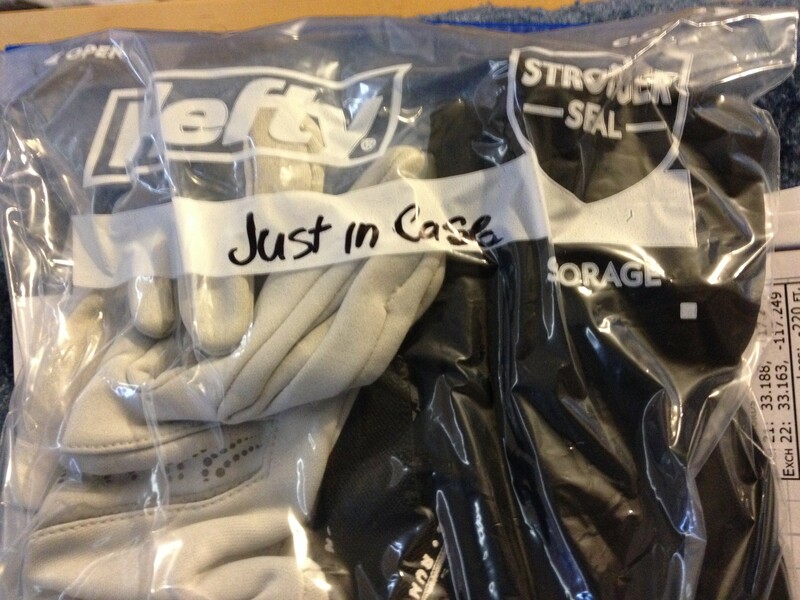 My “just in case” bag had an extra pair of pants, extra socks, my number belt, and a pair of gloves. My number belt was in this bag because my mom and I were using magnets to hold our number on. I also packed a second pair of shoes. I wasn’t sure I should bring them but was really glad I was able to change them out when my toe started to get a blister. The hardest part of packing was deciding what bag to bring. I didn’t want something too big and take up room in the van or too small that I couldn’t fit everything. The other essentials that I packed were things to sleep with. I packed my hammock (sadly didn’t get to use), a sleeping bag, small blanket, and my travel pillow. 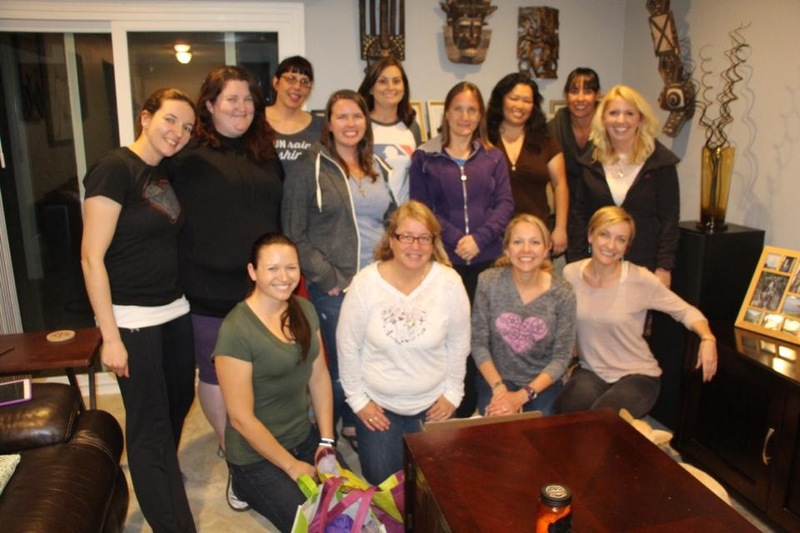 Thursday night before the race our team all met up at Shannon’s house to decorate the vans and eat dinner. It was so much fun decorating and meeting everyone. We had a great group of girls and were excited for the following days. Our team All ready for tomorrow!! 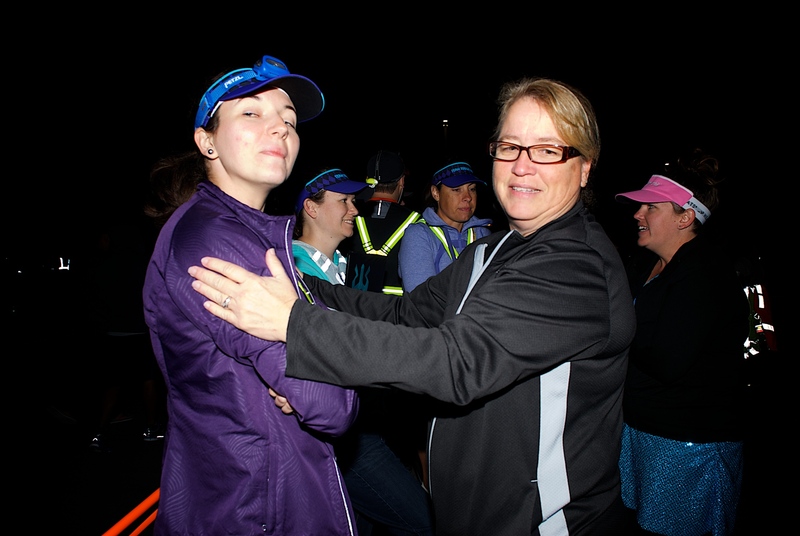 Julie, my mom, and I drove one van home as we were planning to meet everyone at the start line the next morning. There was no reason for us to drive from Huntington Beach to Lake Forest and back to Huntington Beach for the start. On the way home we lost almost all of our fringe, and the magnets. 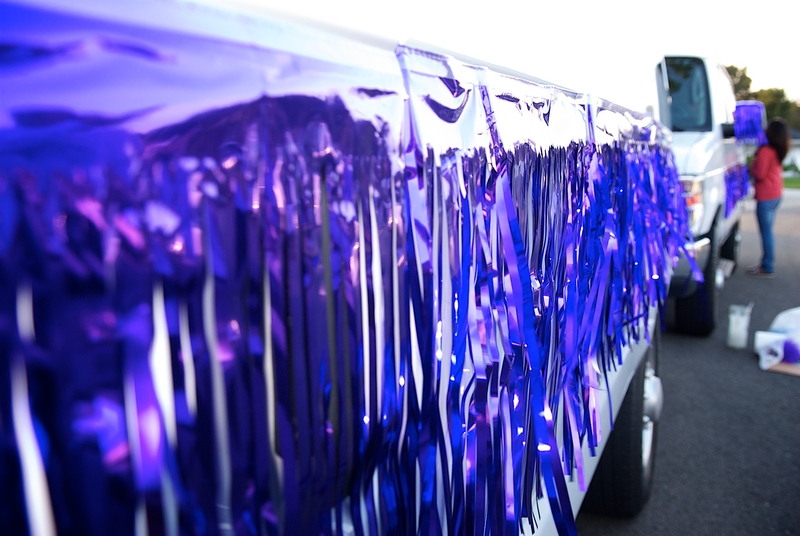 We learned very quickly which decorations would not work on the freeway.